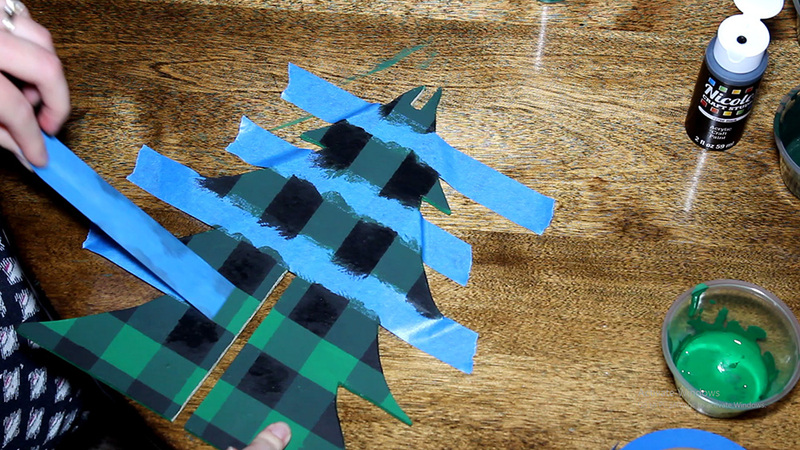 This Christmas I haven’t done any projects with the nativity scene, which is what Christmas is all about. 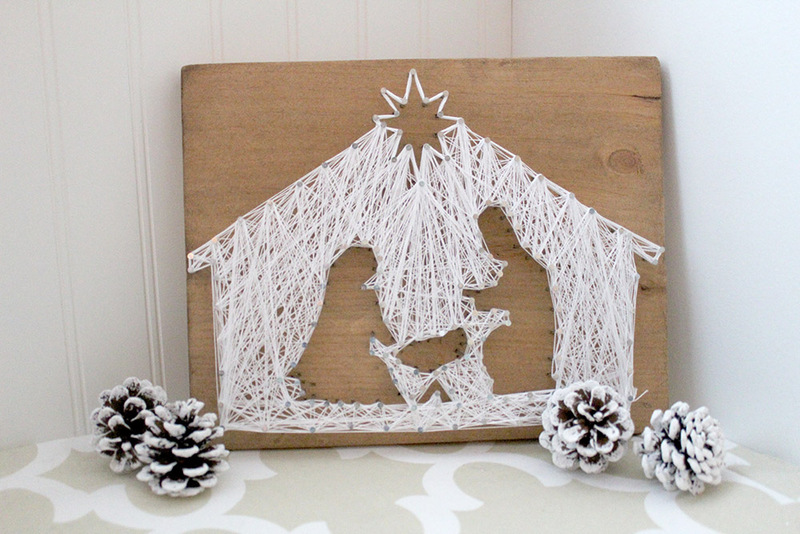 So of course, I wanted to incorporate a nativity scene into my holiday DIY this week. 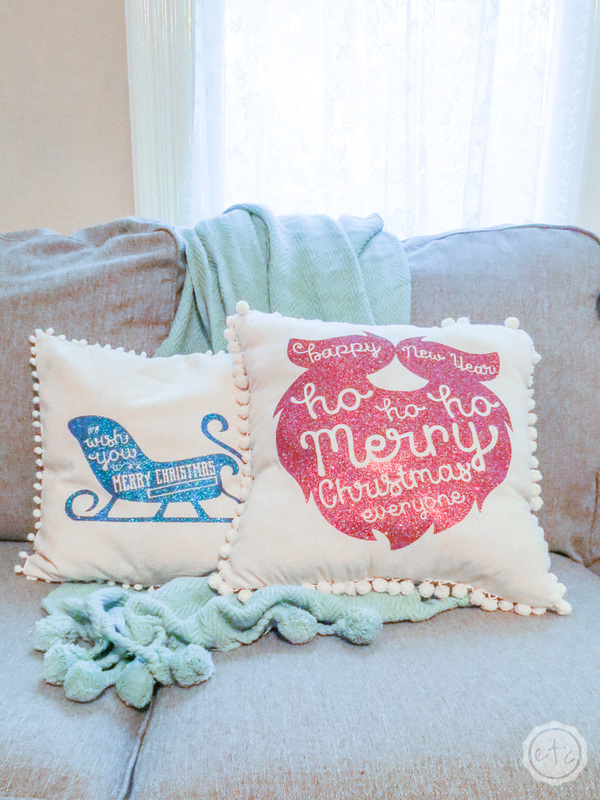 This week is the conclusion of our holiday blog hop – Deck the Home, which is a five-week series of amazing Christmas DIY projects of the home. 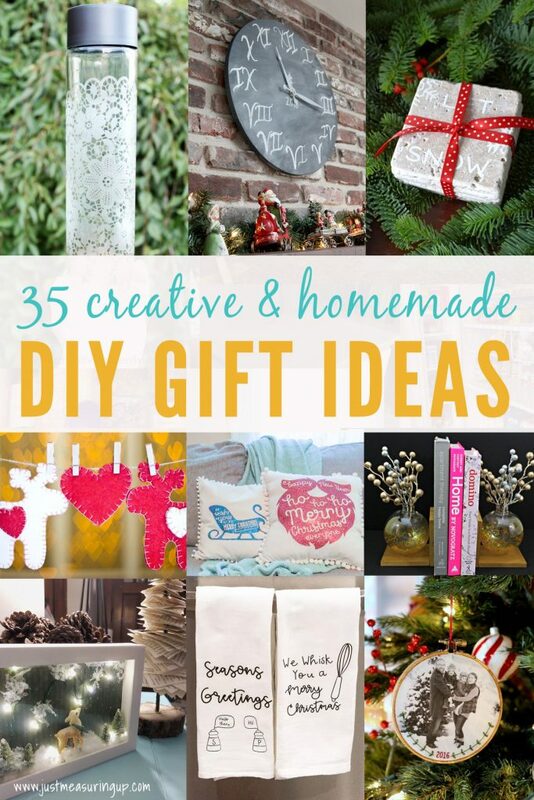 Hundreds of projects have been shared by 25 very talented DIY bloggers. Be sure to scroll to the end of the post to check out everyone’s home decor. And even though the hop is ending, we have quite a few weeks before Christmas, giving you plenty of time to work on some of your favorites. So back to the nativity scene project. I wanted to create a giant nativity scene for the yard, but my hubby insisted on a simple reindeer and Santa sleigh instead. Since it was the last week of the hop, it was final chance to incorporate the nativity. 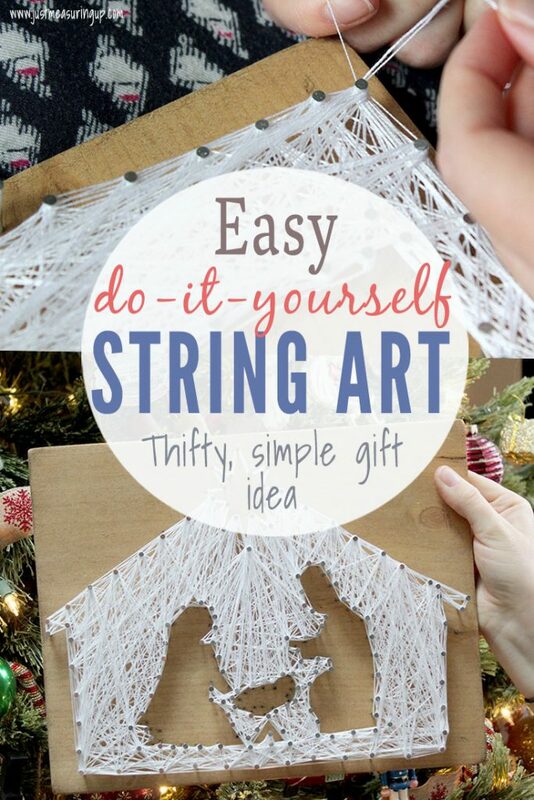 I had also been wanting to try DIY string art because I’ve seen so many cool designs. 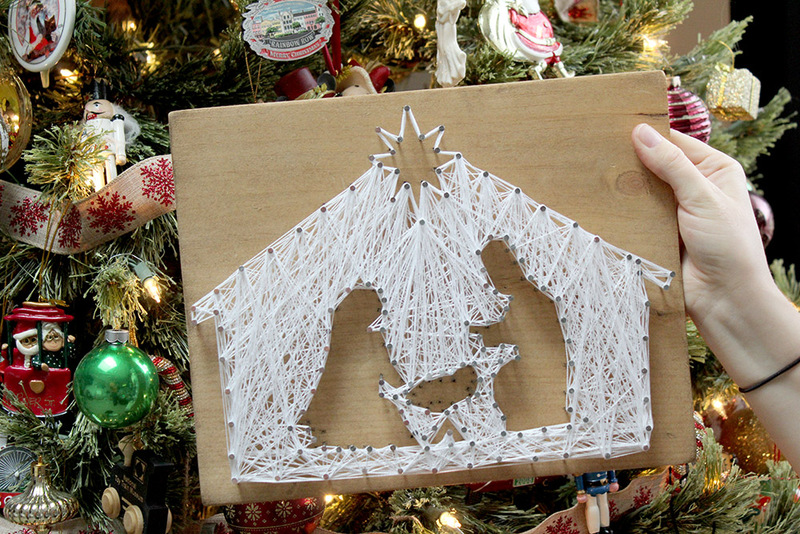 Therefore, I decided to try my hand at creating a DIY string art nativity scene. 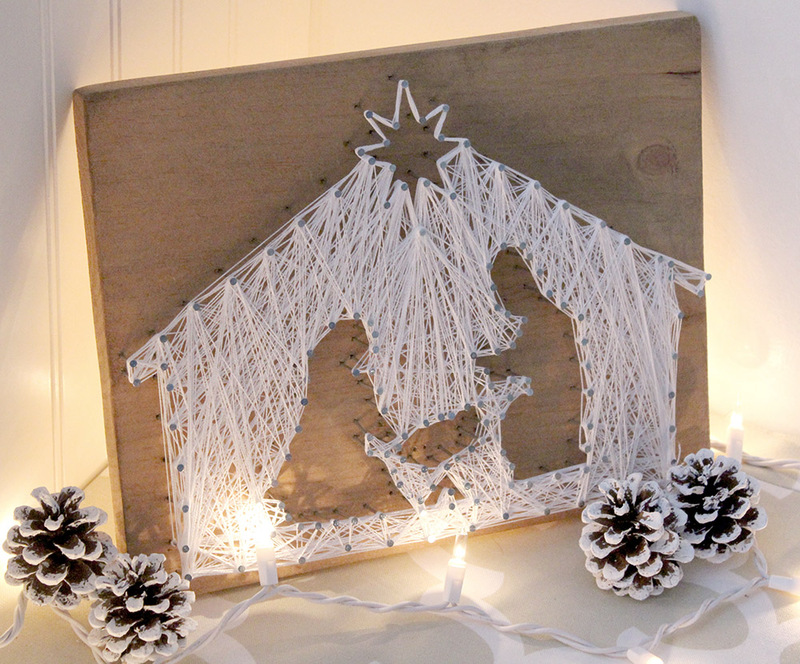 Here are the steps I took to create the DIY string art nativity scene. Since this was my first time doing string art, I hope you find all the string art tips and tricks for beginners helpful. 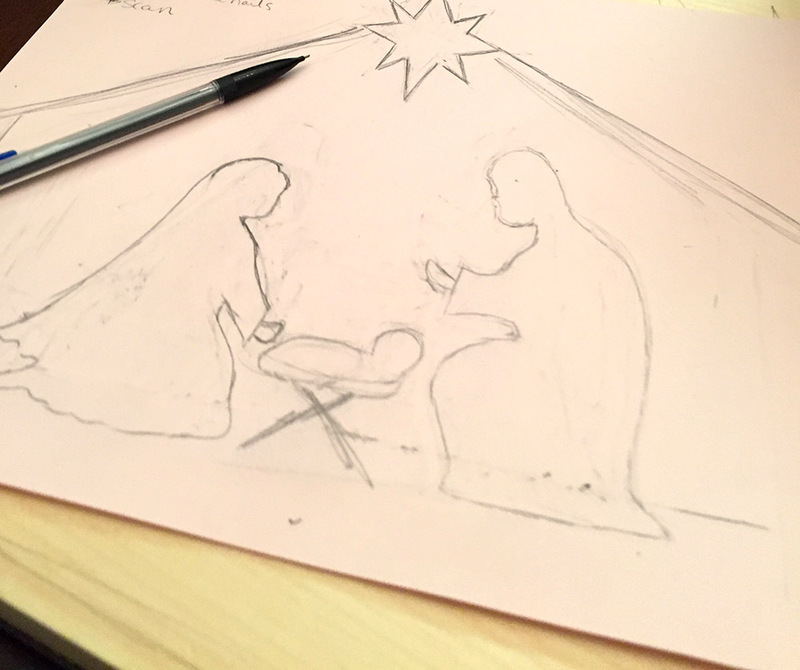 First, I drew the nativity scene on a piece of card stock. I figured the 8.5×11 paper was about the size that I wanted the nativity. You could draw the design out yourself or you could use the one I drew. 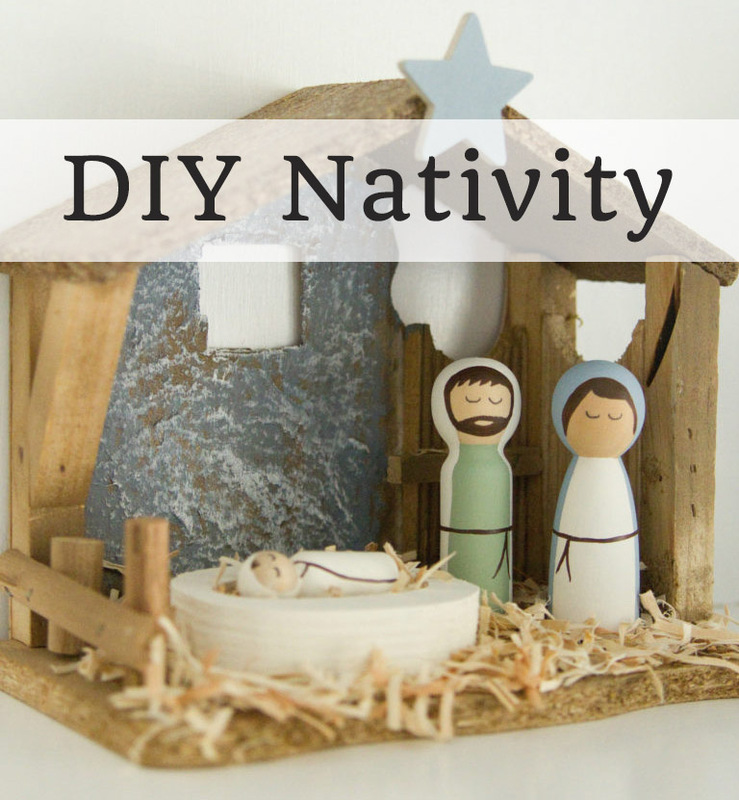 Subscribe to our mailing list for DIY updates and tips PLUS get instant access to the nativity template and lots of others files and free printables. 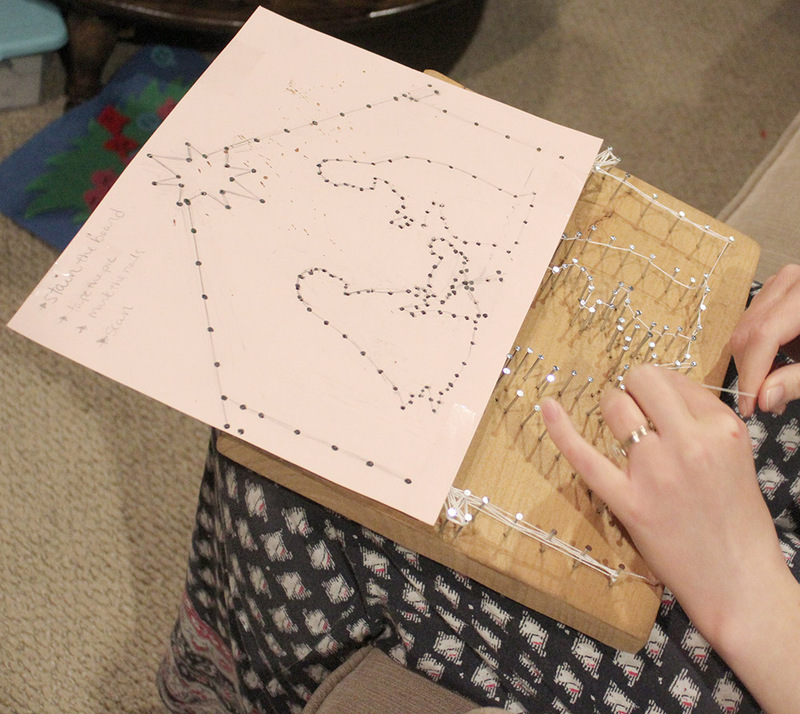 The next thing I did on my DIY string art project was I marked my nail holes with a black pen. You want your nails to be about 3/4″ apart. The more consistent, the better because then you can make more even/symmetrical patterns. In fact, you could even use a spacer (grab a drinking straw and cut it down to 3/4″) to be consistent. In Hindsight: Some of my nails were marked way too close. 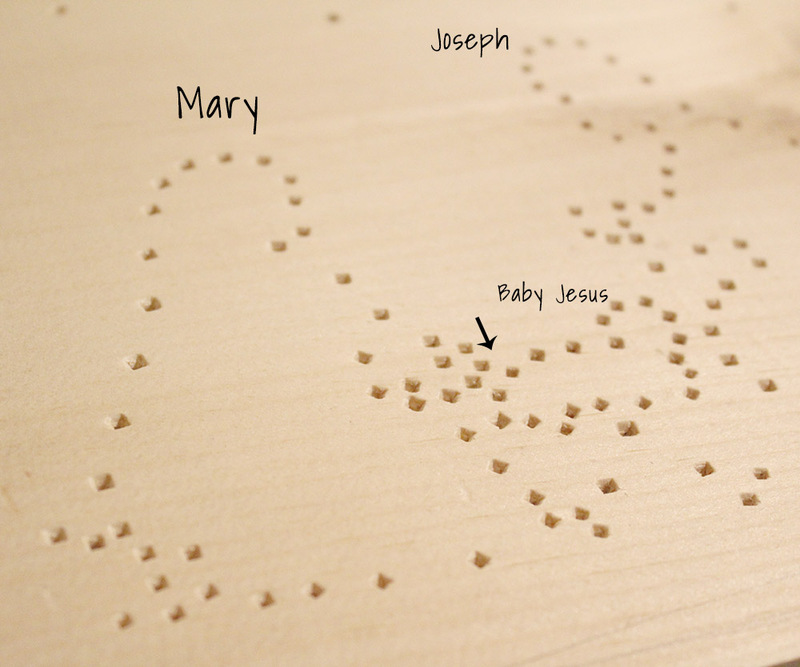 I did this to try to get the curves of Mary and Joseph and a tight outline of the manger. But it makes your string harder to tie – and the pattern more confusing to follow. Also, I ended up leaving the hand off of Mary because there wasn’t enough space in between her and baby Jesus to give a nice outline. 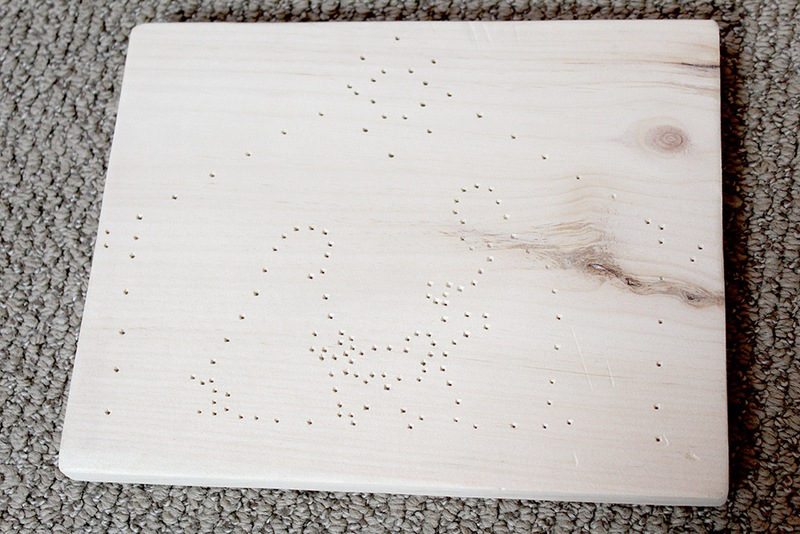 When you are drawing and marking your nail holes, be sure to have a nice clean outline of your shapes or people. After I marked the nail holes, I taped my picture to a piece of wood. Then I took one nail and started tapping it through the paper into the wood, to mark the hole. I used the same nail and continued to do this for all of the holes. 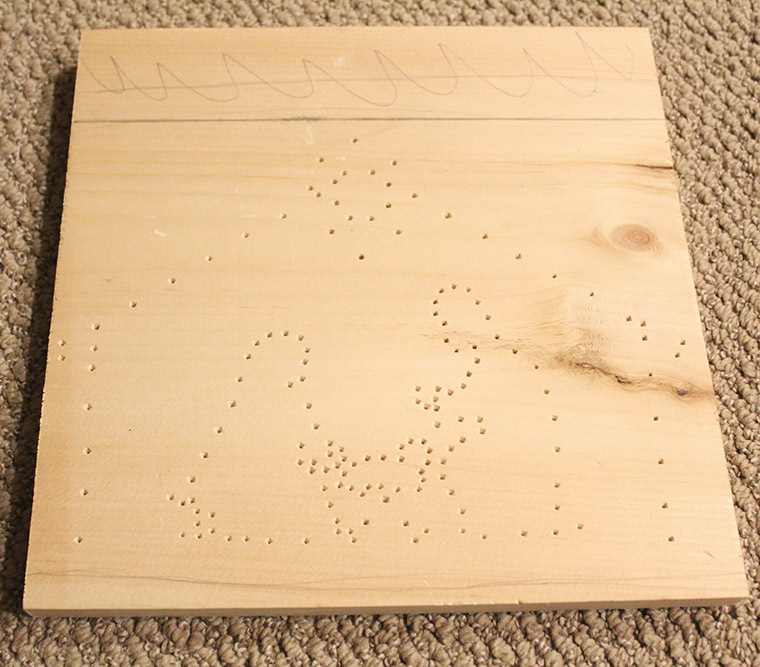 When I removed the paper, I had each of my holes marked for the string art. If you look at the below picture, you will see that my holes are marked too closely between Mary and baby Jesus. Again, you want to make sure that each area has a clean outline. It shouldn’t be hard to decipher, like this part. 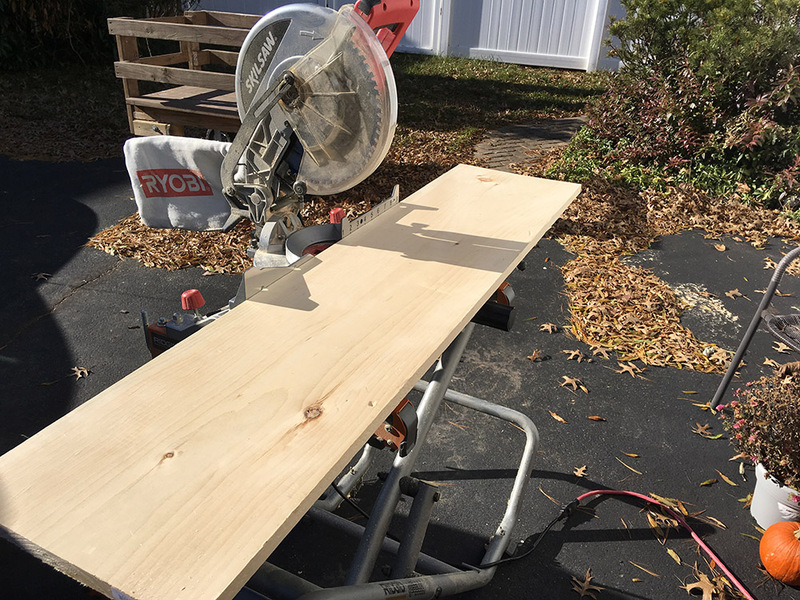 Next, I used my table saw to trim off the top of the wood. I sanded down this side and any rough areas too. After my nativity scene pattern was on and my wood was trimmed, it was time to stain the wood. I used a homemade natural stain for this – which I absolutely love. Decide you want to use the positive space or the negative space. 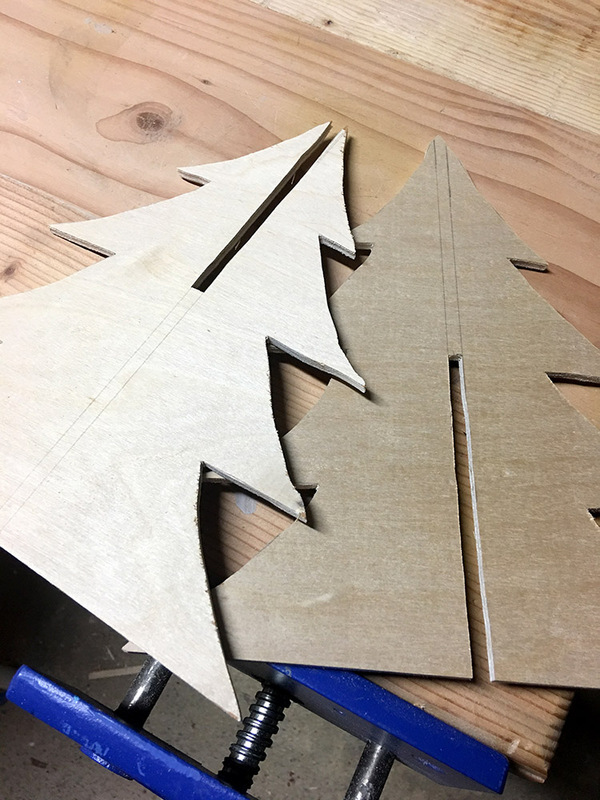 I went with the negative space – which means instead of filling Mary, Joseph, Jesus, the star, etc in with string, I left them blank. Instead I filled the space around them with the string. When you are thinking about positive and negative space, think of using a cookie cutter in dough. The actual cook is the positive space and the scraps around where the cookie cutter went are the negative space. Take your string and start in a corner. Wrap your string around the nail and tie it a couple of times. Be sure to leave a tail on your string so you can hide it later. 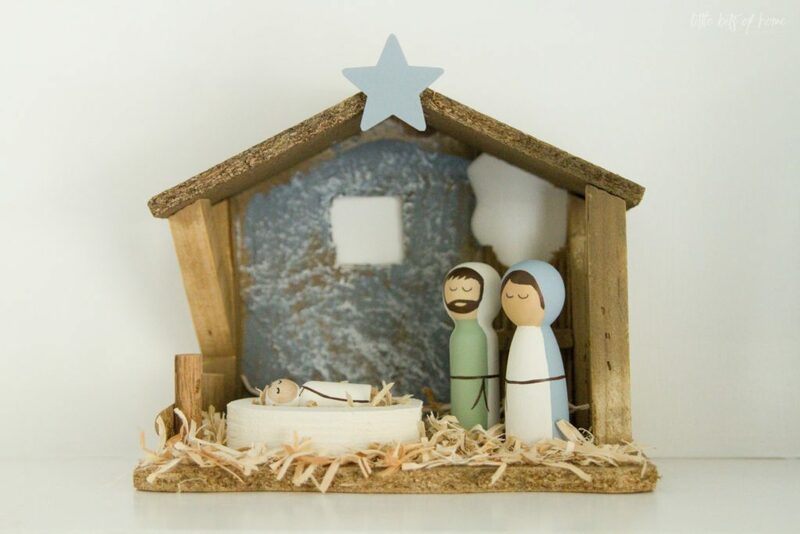 If you are starting with a busy scene or design, such as this nativity scene, then start with an outline of your scene. It will help you see your pattern and go from there. 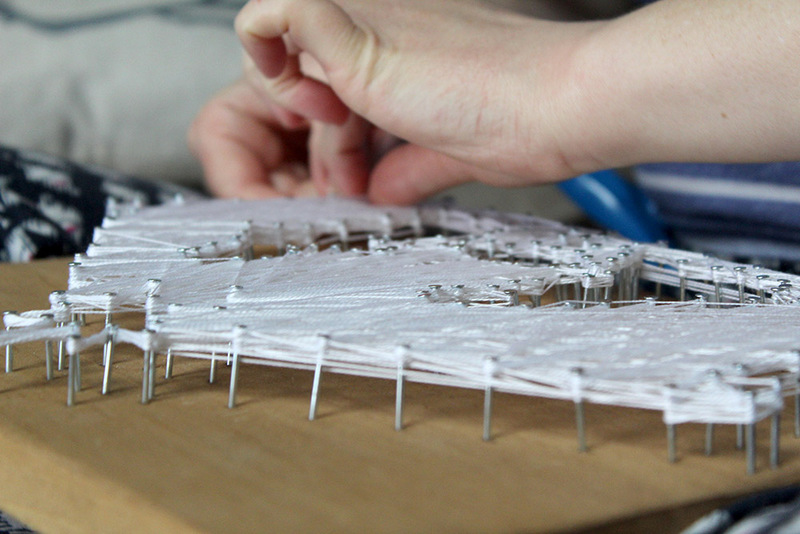 Here I am using my pattern to making an outline with my string. To wrap your string, you can use a variety of different ways. You can weave the string around the nail holes in an almost zig-zag pattern – like if you were running an obstacle course lined with cones. 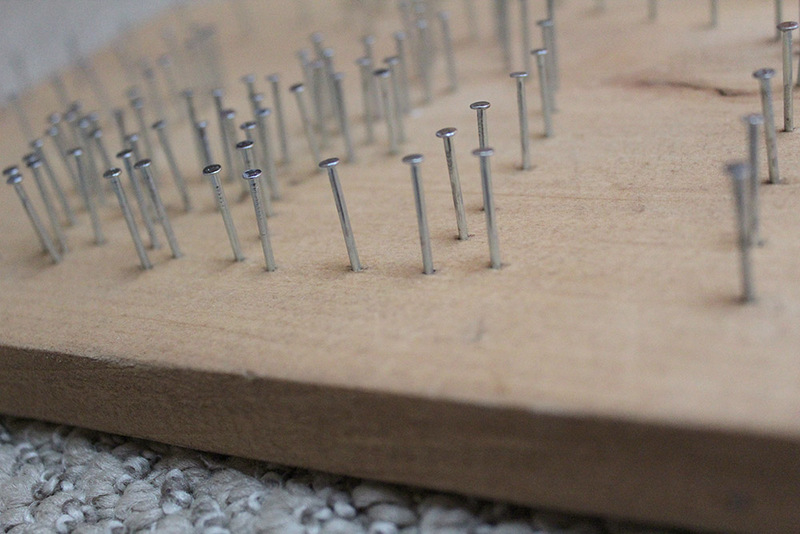 You can wrap the string around each nail hole in a loop. This is good for keeping a straight line or for anchoring your string once in a while. You can make patterns – such as lines coming out from one point, zig zags back and forth, or up and down hills with the string, making almost triangular mountains. 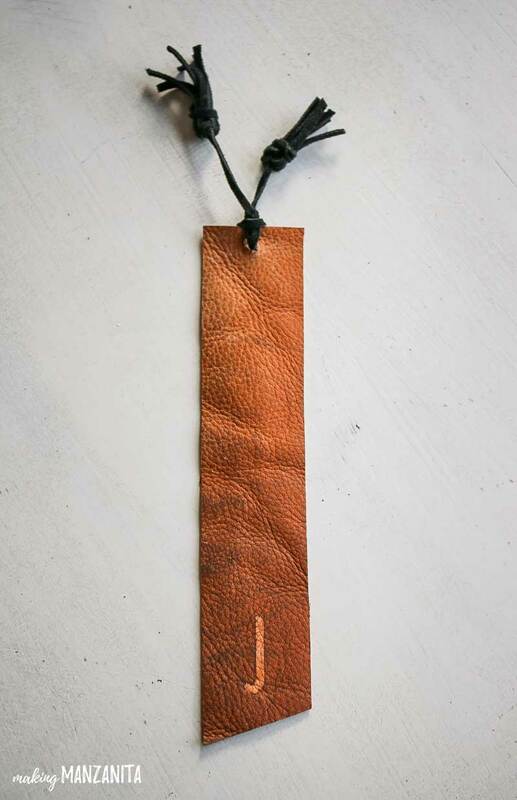 Basically, you can wrap your string any way you want it. 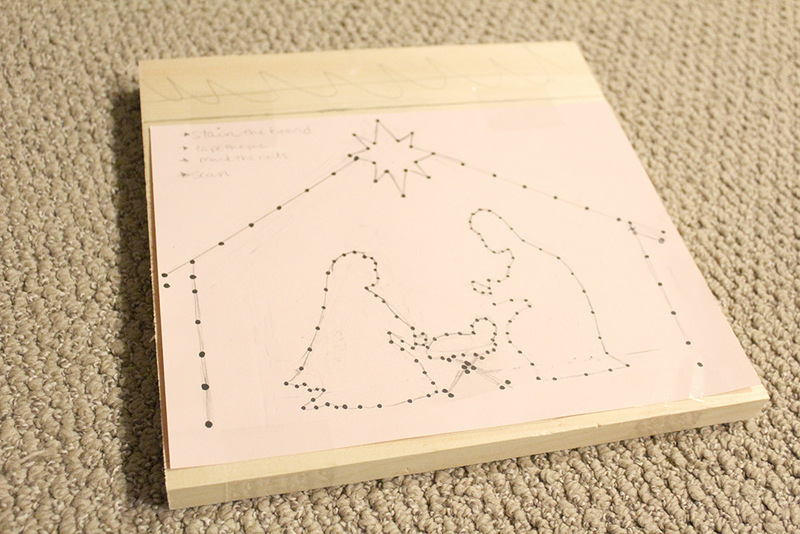 Once you have your outline, bring your string over to where you want to start “filling in” the nativity scene. To bring back your string, you just keep wrapping it or weaving it around the nails until you are in the desired place. 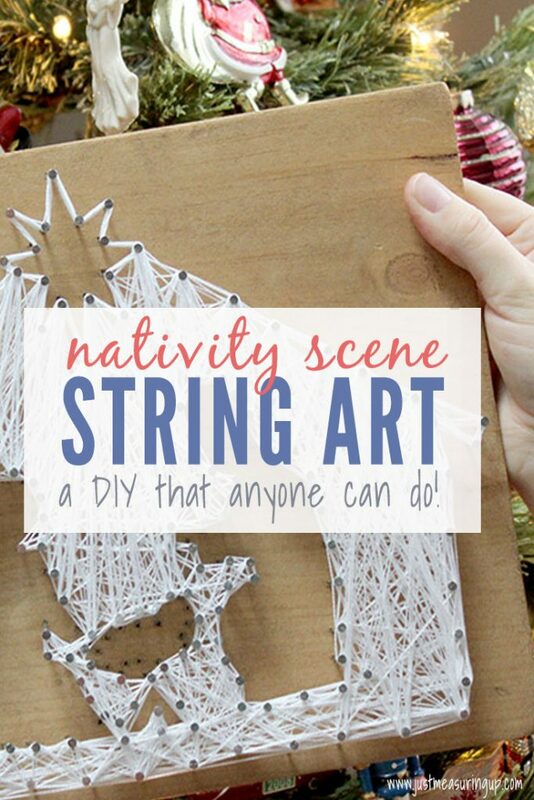 Then, start “filling in” the nativity scene using one of the ways above – or using your own way to wrap the string. Be careful not to cross the string over any areas you don’t want filled in. I did that waaaaay too many times. 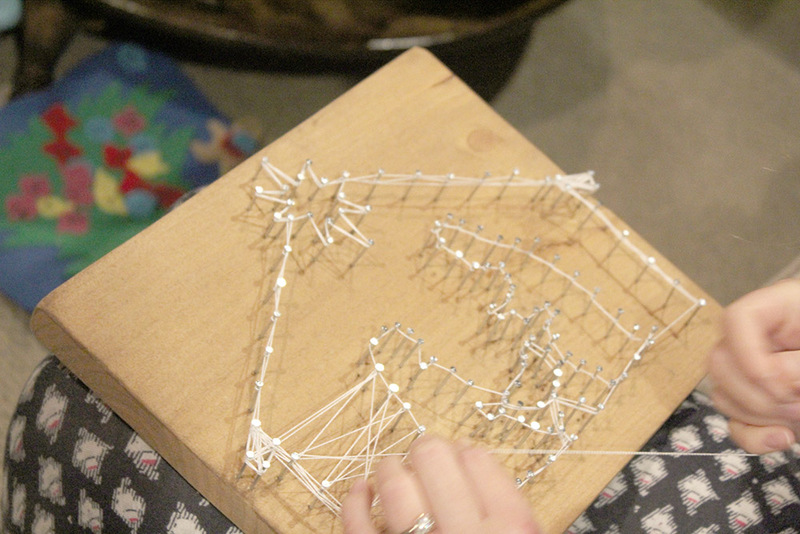 Below is a picture of me starting to do a zig-zag pattern with the string art, working my way around the picture. You’ll keep wrapping your string and filling in your picture until you are content with it. I used a ton of string and kept wrapping and weaving in all sorts of patterns to get a filled in look. 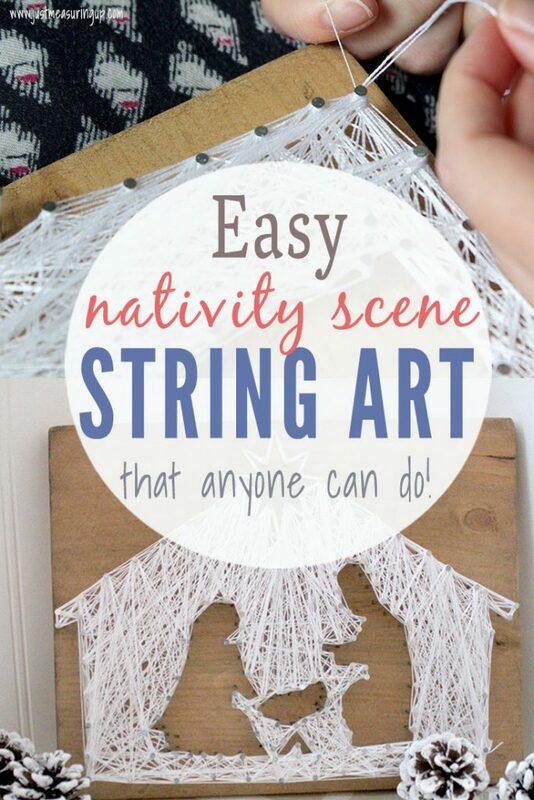 If you feel like you are losing the shape of any of the things in your nativity scene, then work your string to the point and outline it with the string again. 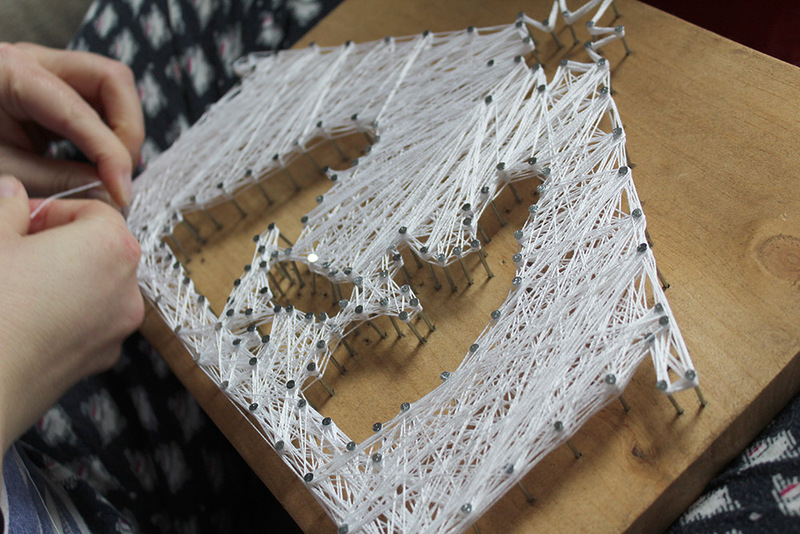 To do this, just work your string around the perimeter of your shape. 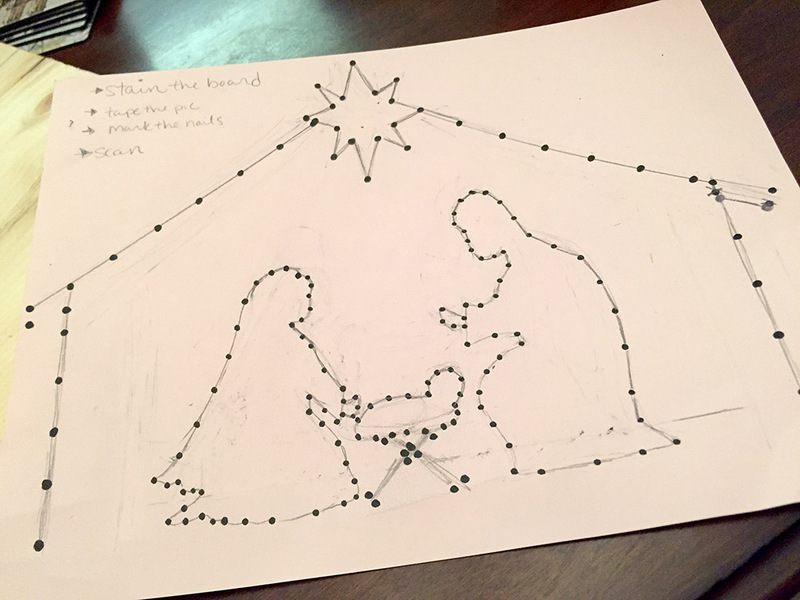 I did this with the star – I had so much string everywhere and I had only outlined the star once, that I felt that the star got lost.Then, I just worked my way around its perimeter again and again until I was happy with how it looked. I also went around the perimeter of the stable a few times too, to give it a nice clean outline. 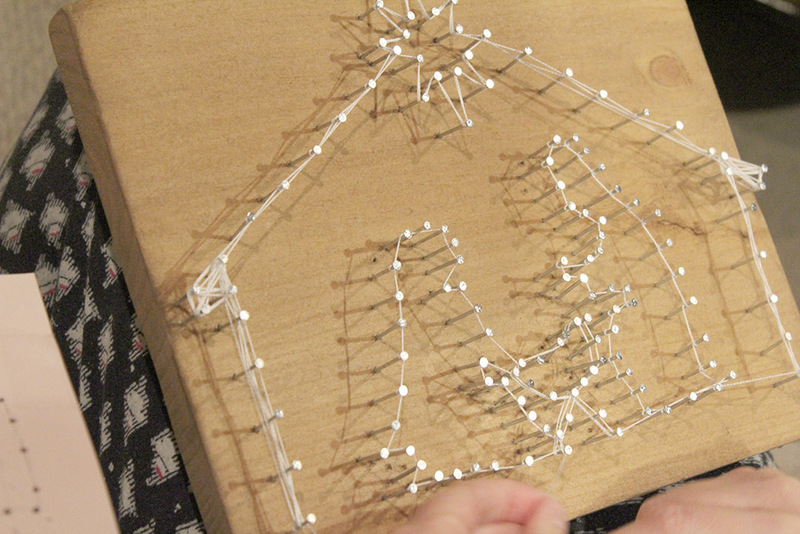 Once you are satisfied with your string art scene, then bring your string back to your starting point. (Do this by weaving or wrapping it until you are in the desired place). Then, take your ends and tie them together. 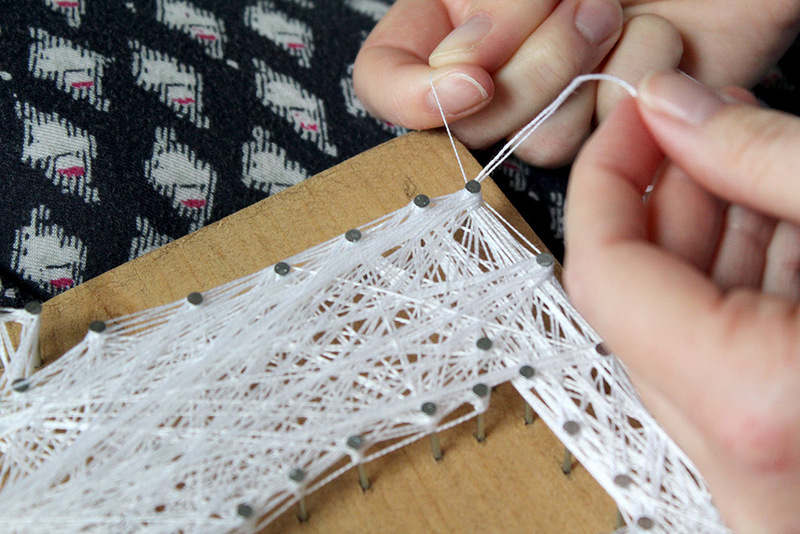 With the tails, you can either weave them through your string art (easiest way is by using an embroidery needle). Or you can just hide it underneath. 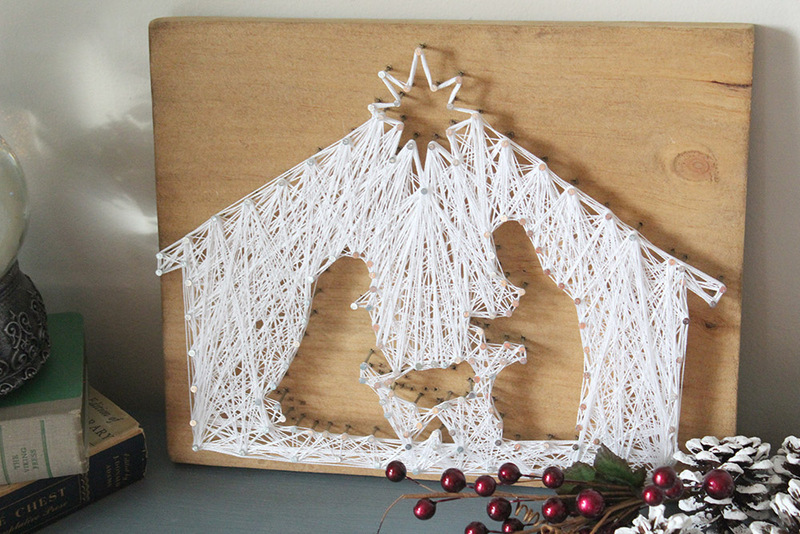 Here is my finished string art nativity scene. Not bad for my first time with string art!? It was a little time-consuming to hammer all the nails and to wrap the strings. However, wrapping the string was very therapeutic. Like doing a puzzle or coloring. Of course, you had to pay attention to your outlines – but overall it was a very calming activity. As far as total time, I would say maybe about 3-4 hours total. The cost for me was just the string, which I bought for a buck or two. 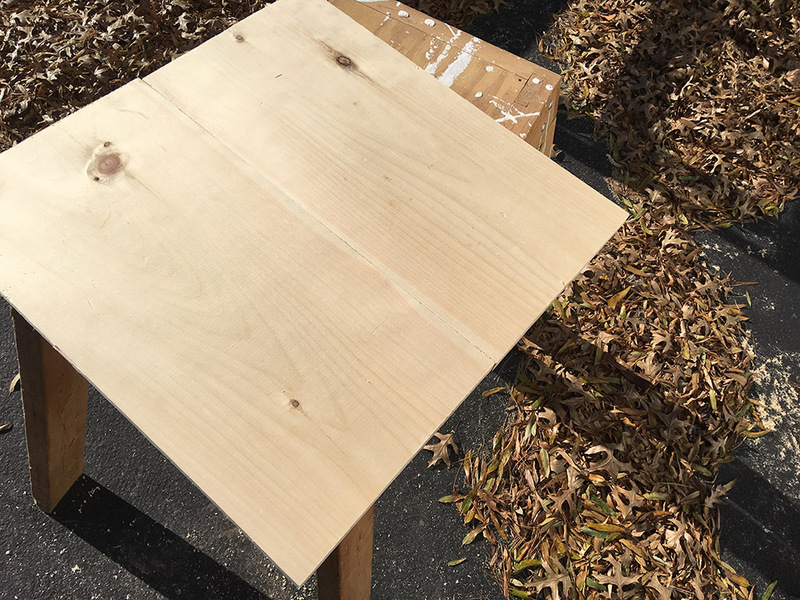 The nails and wood we had – and I made the stain with ingredients from my pantry. Also, factor in whether you are going to add hanging hardware to back. I think I’ll keep ours leaning on the wall. 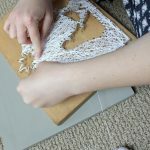 If you are looking for a fun, calming holiday DIY project that you can decorate your home with or give as a gift, definitely try string art. There’s no fancy skills involved! 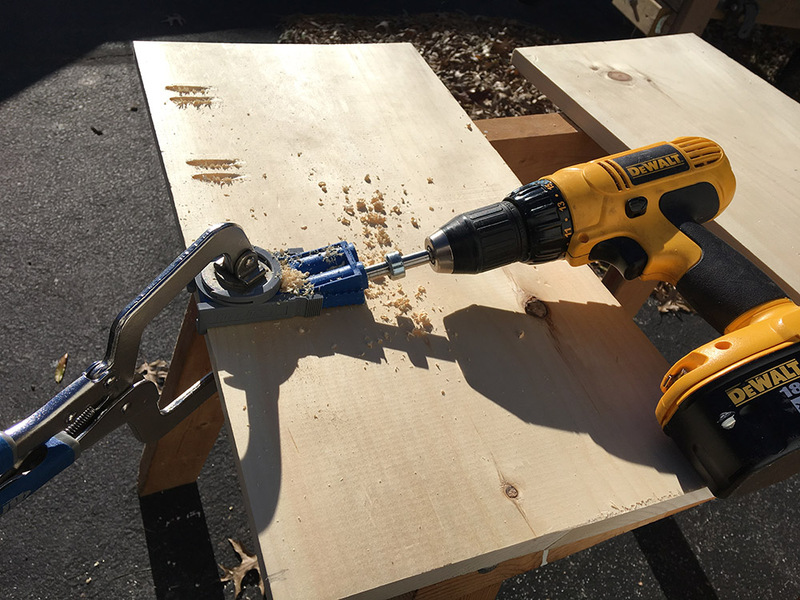 That’s it for our holiday Deck the Home DIY projects. 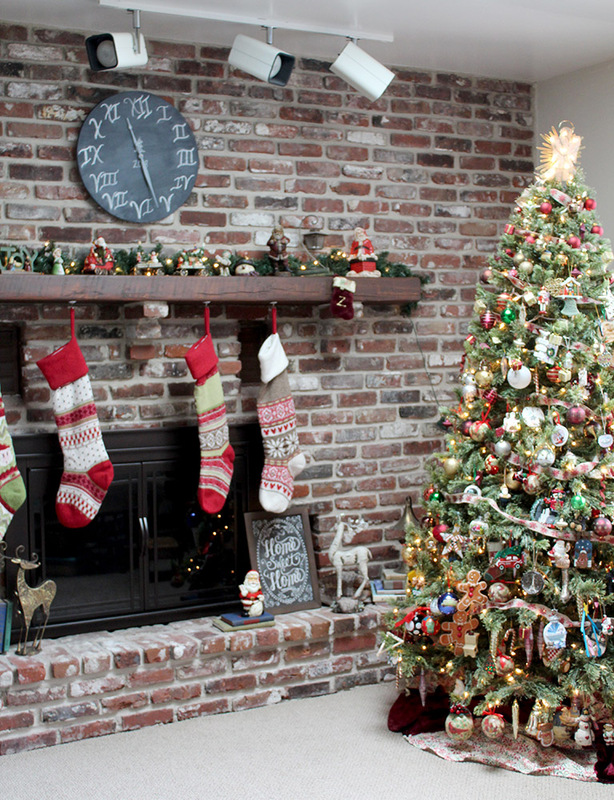 If you missed any, check out all of the 2018 Deck the Home holiday projects. Have you ever made one of those snow scenes? With the miniature houses, the little people, and the fluffy fake snow? We made one in our old house. We cut a piece of plywood to fit the window sill of our bay window and made a little snow village there. But then we moved to our new home, and although we do have a bay window in our new house, it is a completely different size. So our little snow scene has been up in the loft for a few years. Since I’ve already decked my home out for the holidays, I’ve been looking for more things to decorate with. I’ve been wondering what kind of project I could do with the miniatures and the village, and I found some great inspiration from Patti over at Renovating Mapleson Manor. 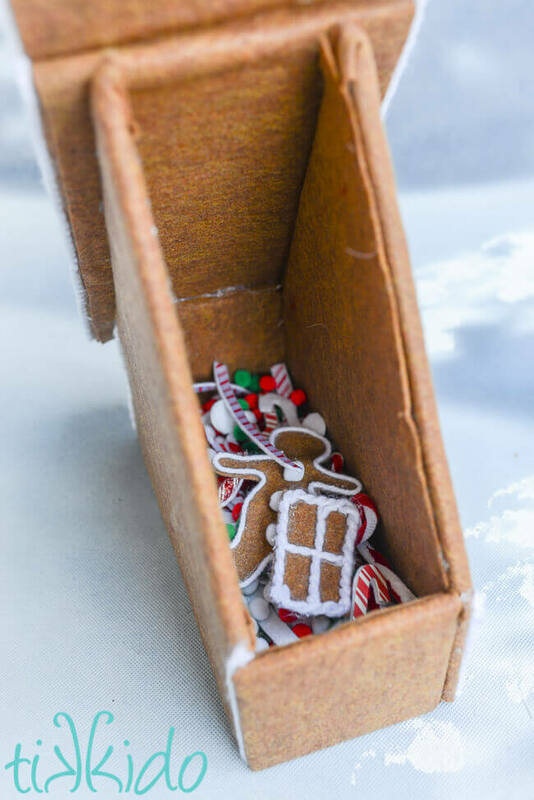 For our Deck the Home blog hop (which is a 5-week series of DIY holiday themed projects by 26 home bloggers), Patti shared a Christmas shadow box that is simply adorable! 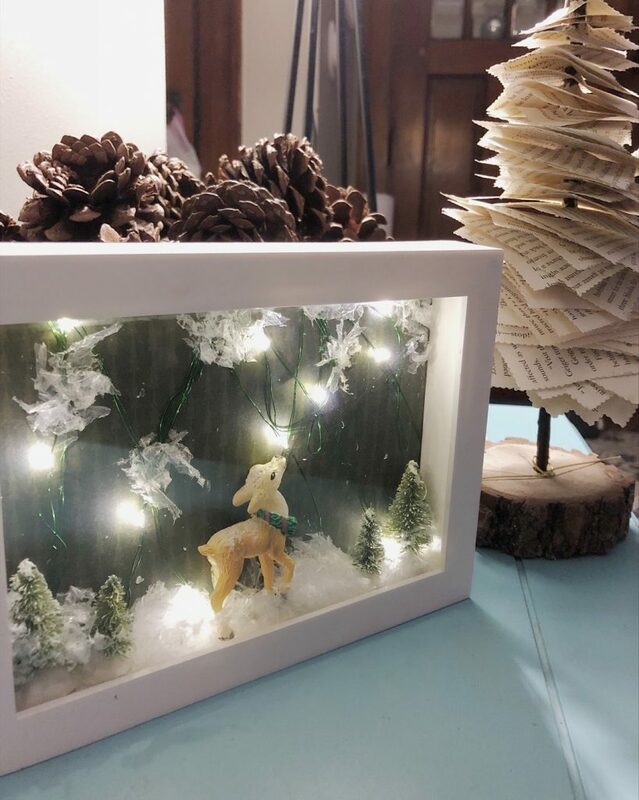 With just a few materials she created a sweet little snow scene complete with reindeer and trees in a shadow box. Like all amazing Christmas things, it lights up too! Her tutorial and pictures are super easy to follow that you’ll be making one in no time! Patti is a DIY blogger who has renovated her fixer upper. She has lots of befores and afters of her renovation as well as client spaces too. 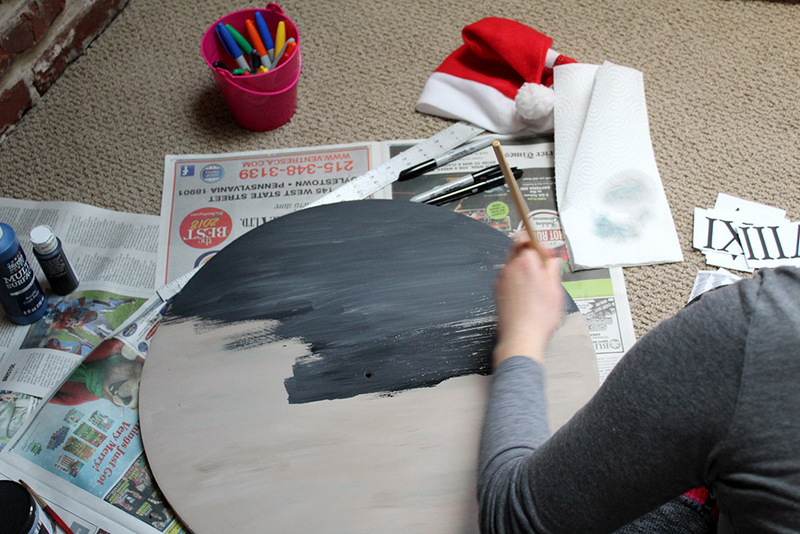 Don’t forget to check out her DIY projects too – she’s so creative! 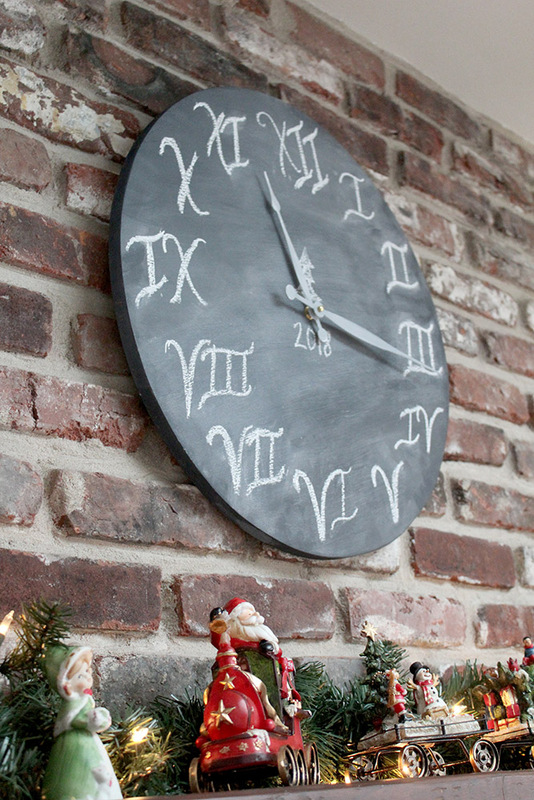 If you missed our project this week, we made a DIY chalkboard-style clock! 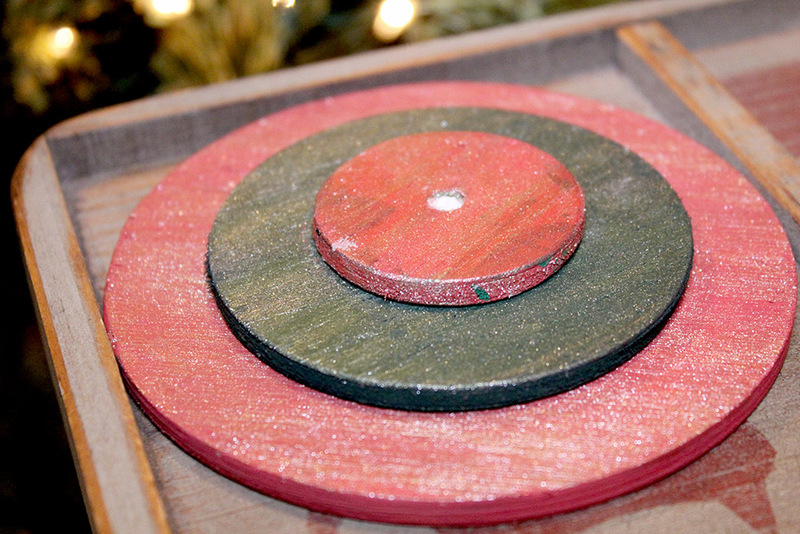 Check back on Friday to see more DIY holiday gift ideas from the Deck the Home blog hop. Next week is our last official week of the blog hop. Also, the theme is home decor – get excited!! I totally have a thing for clocks. I can’t walk into a Hobby Lobby or a Bed, Bath and Beyond without hemming and hawing over a wall clock. Yet, wall clocks in the store can get quite expensive. I always wanted to make my own but I never got around to it. 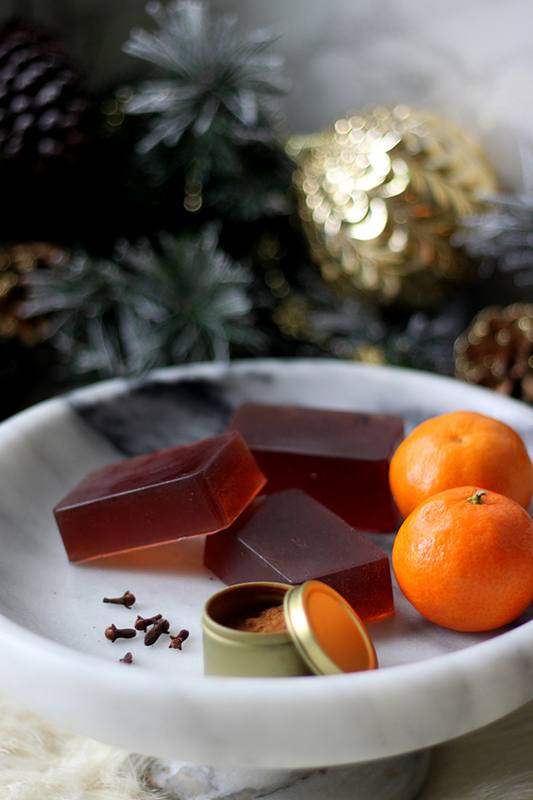 As part of our Deck the Home blog hop, this week’s theme is a DIY gift. When the clock stopped working, it was the perfect opportunity to make my own! 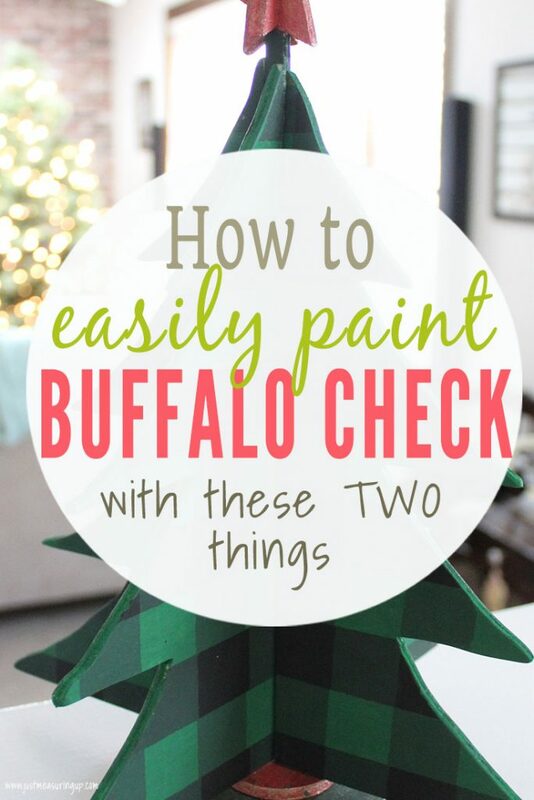 It was super easy – the hardest part was deciding what color to paint it! If you are totally in love with clocks too, try your hand at making your own (see what I did there?!). 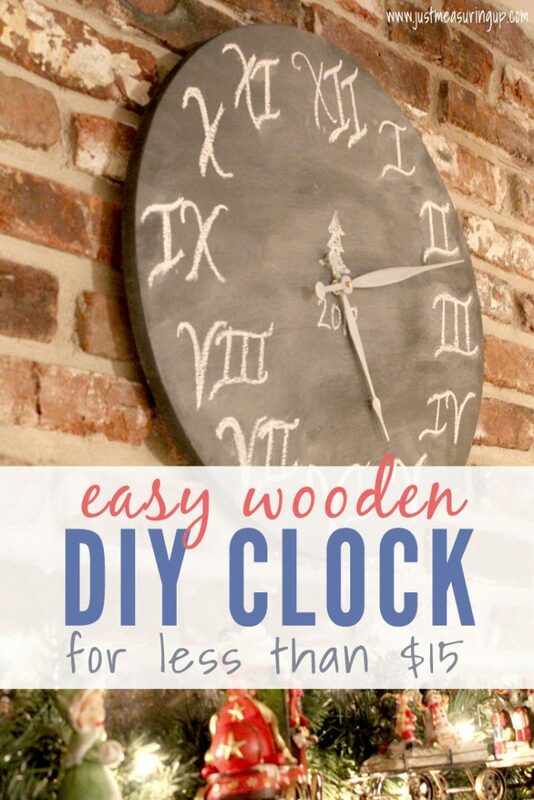 Here’s how to make your own DIY wooden clock. Making the wooden clock was super easy! 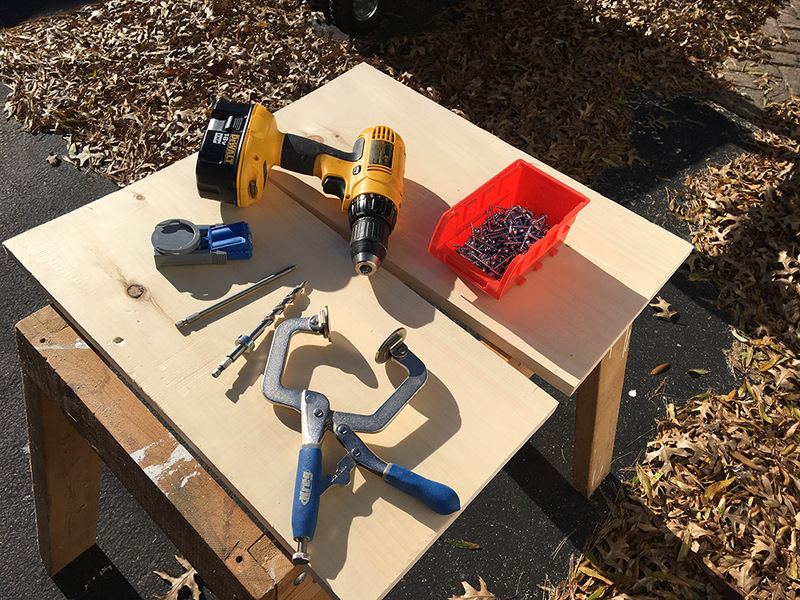 Here’s the materials and tools needed for the project. To make our clock, we first needed a square piece of wood at least 20” wide (the diameter of the clock). We didn’t want to use plywood (which could easily be cut to this size), but instead opted for boards. 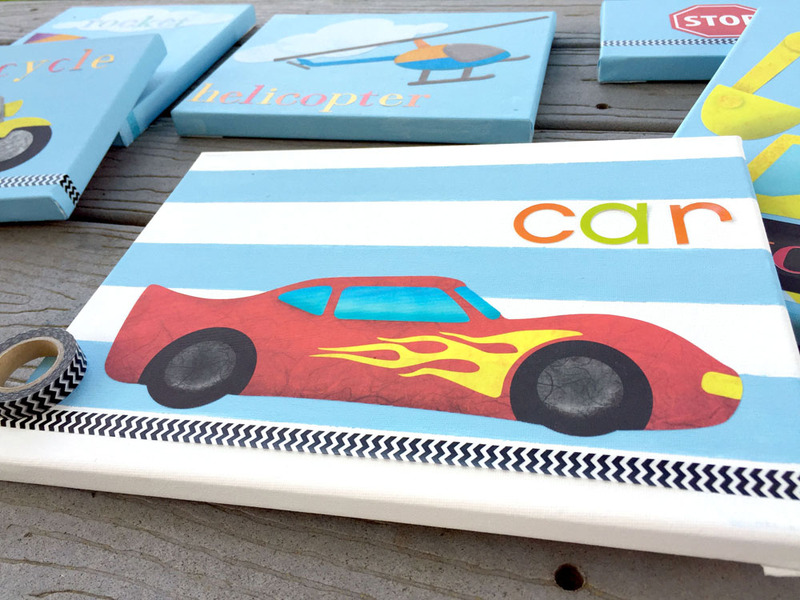 Using boards would result in a better look and higher quality. 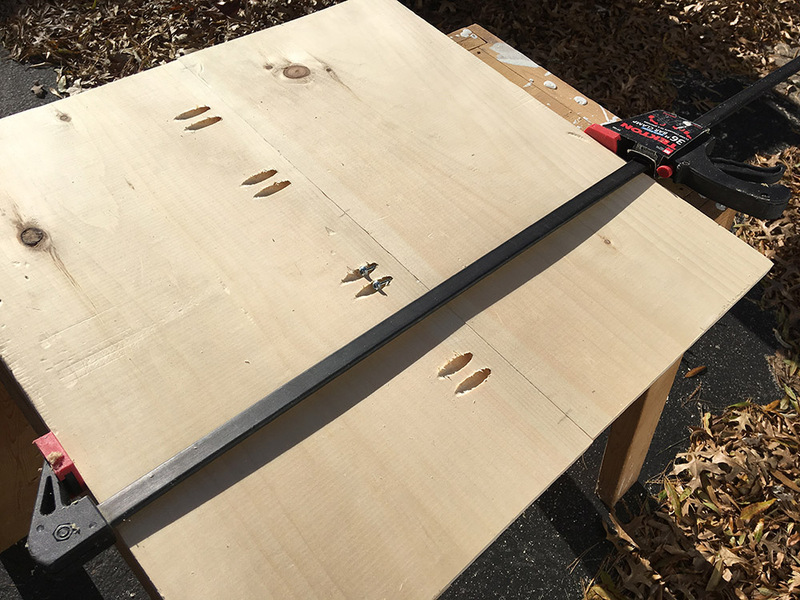 However they don’t come large enough for a 20”x20” piece, so we used two smaller boards and joined them together with pocket hole screws. We had an extra 12” wide board left over from a previous project that would be perfect for the clock. We made the board cuts roughly 22” each. Even though the clock diameter was only 20,” it would be easier to make the circular cutout of the clock if the board dimensions was padded a little bit. With two cuts of board done, we were ready to join them together with pocket holes. The pocket holes were going to be on the back of the clock, so I didn’t have to plug the holes to make them look nice. We now had a solid square board large enough to accommodate my 20” diameter clock. 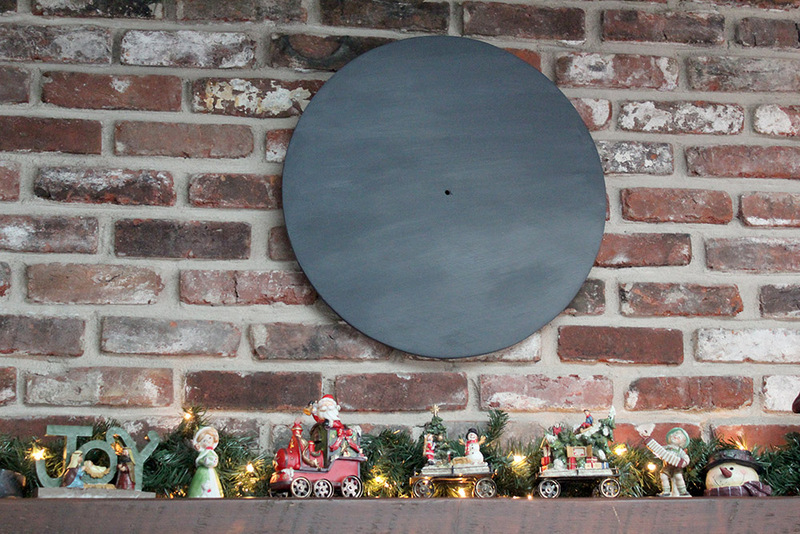 We had an existing 20” diameter clock on the wall that was being replaced with this DIY clock. So I traced the outline of that clock to make my circle. 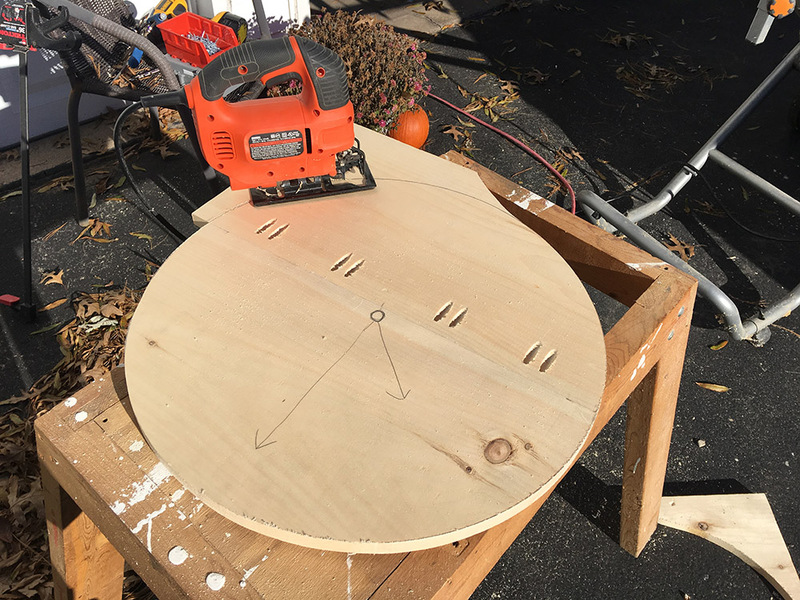 If you’re making your own clock, just look around the house for something round that’s close to your target diameter (like another clock, a plant pot or plate). Alternatively you could even use the pencil and string technique to make a circle outline. Simply tie a string (or wire) to a pencil. Then pin the other end of the string to the center of your board (to be used as a pivot point). Pull the pencil until the string is tight and start drawing your circle. Move the pencil around the pivot point keeping the string tight until you have drawn a complete circle. 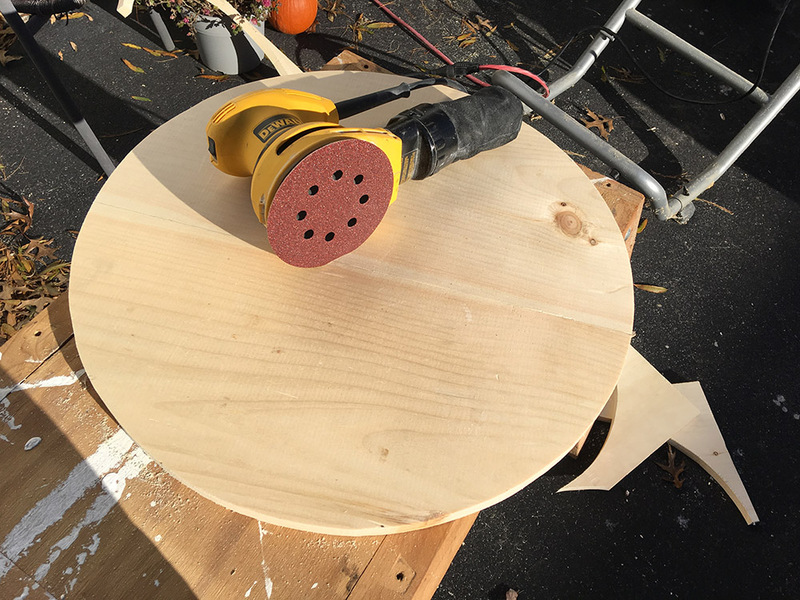 Finally it was time for a sanding with the orbital sander. I used 120 grit paper, and gave both sides of the clock a good sanding. The seam where the two boards met practically disappeared after the sanding. I also hand bevelled the edges too with the sander to remove any splinters. To prep the board to transform into a clock, I had to mark the positions of the numbers. 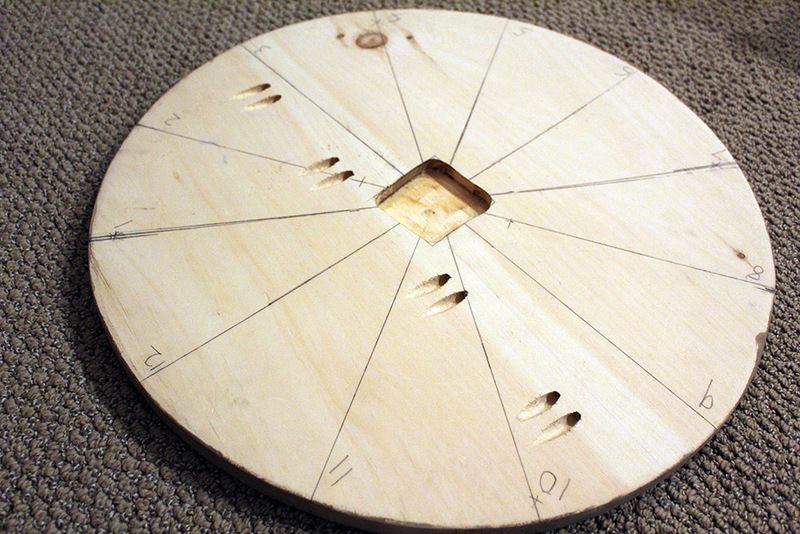 So I located the center of the circle, drilled a small hole and drew lines every 30 degrees (using a protractor). Each line represented an hour on the clock dial. I made all these lines on the back side of the clock, and used them as references later when placing the clock numbers. 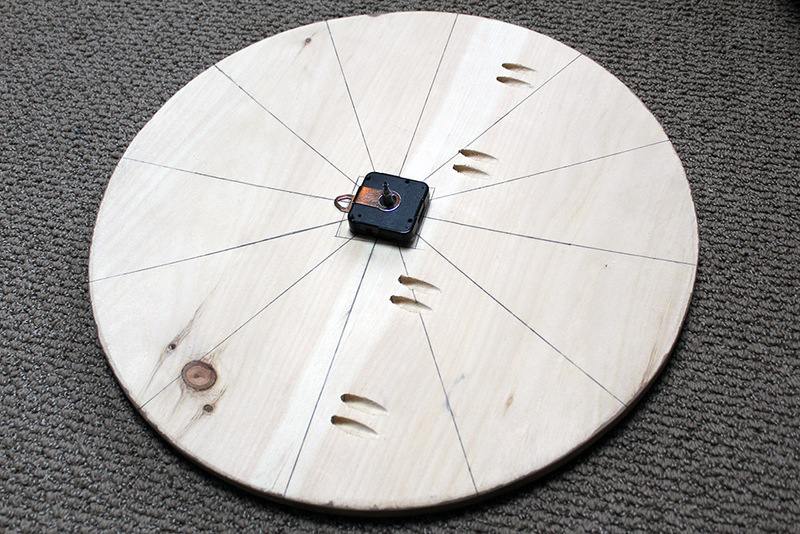 I had purchased a clock mechanism to insert into the circular board. It’s a square device that sits in the back of the clock, protruding through the center where the hands are attached to on the other side. The part of the clock mechanism that runs through the board was not long enough to reach the other side (the ¾” board was too thick). So I had to route out a square notch for the mechanism to sit in. To do this, I draw an outline of the mechanism on the rear of the clock, and gave it a little bit extra space. Then after some trial and error with some scrap wood, I determined an ideal depth for my router (about 5/16”). I used a ¾” straight cutting bit and carefully cut out the notch for the mechanism. The clock construction was pretty much complete at this point. It just needed to be painted. The hardest part of the project was painting the clock because I couldn’t decide on the color. I actually painted the clock three times before I was satisfied with the color. For the actual paint, I used acrylic paint from the craft store. Just the regular little bottles of paint that are usually fifty cents. The bigger bottles probably would have worked better but I always use what I have. Another reason I liked to use this paint was because it was so easy to paint over when I changed my mind. 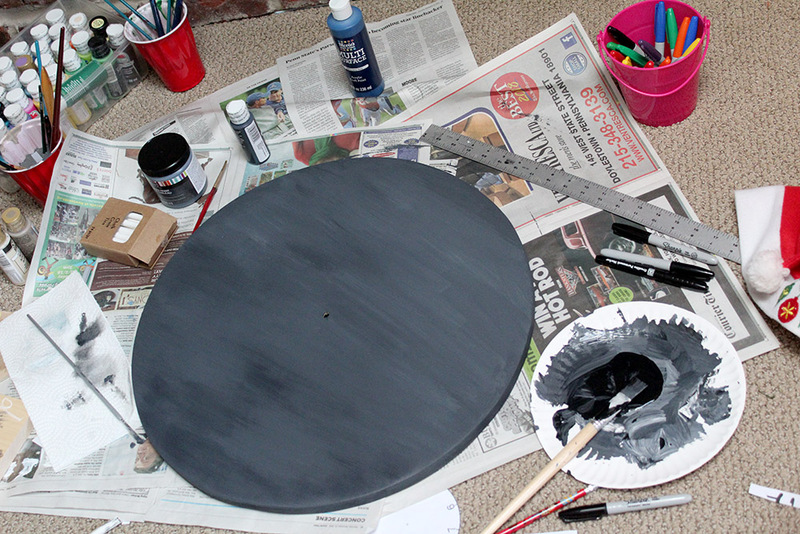 Finally, I settled on a chalkboard black paint color. I used black with a little bit of white mixed in – and then I kind of brushed in more black or white, to make it look like a chalkboard. I painted the top of the clock and the side – no need for the back. I hung it over the mantel to see how it looked, and this time (haha) it passed the test. Third time’s a charm! I bought a couple of chalk paint markers and paint pen markers at the store. However, when I got home and opened them, none of them worked – so I had to make due with what I had. And, that was plain ole regular chalk. I used the marks I made on the back and tried to center my numbers around them. The nice part about using the chalk was that if I wasn’t happy with the number I drew, I just erased it. In fact, I rewrote the numbers so many times that chalk starting smearing on the face of the clock. It contributed to the chalky look, so I didn’t mind one bit. 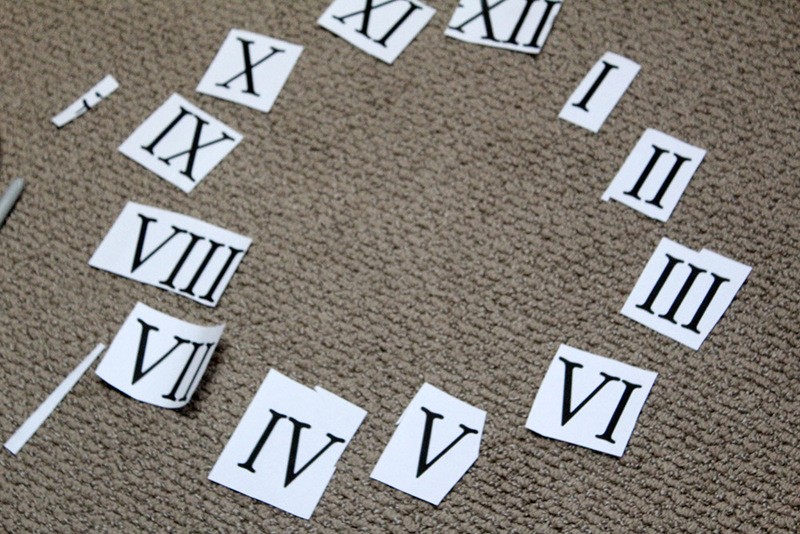 I also printed out these Roman Numerals so I couldn’t make any mistakes. 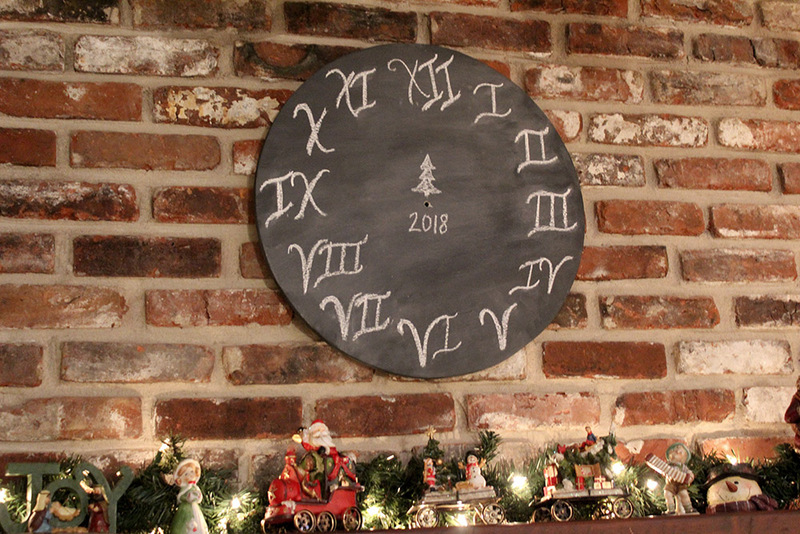 Here’s the clock hanging on the wall with the final Roman numerals drawn on. 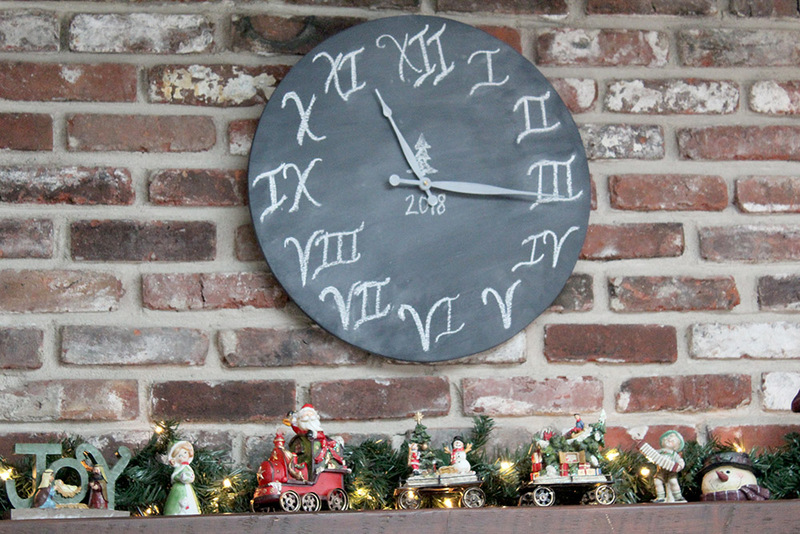 Last, I painted the clock hands whitish gray, as a last minute change from the stark black we bought them in. This DIY project took a couple of hours and cost less than $15. That fifteen dollars went toward the clock kit and the wood. The paint and chalk were from around the house. If you are thinking of making your own clock – or if you have a love for clocks like I do, definitely make your own. 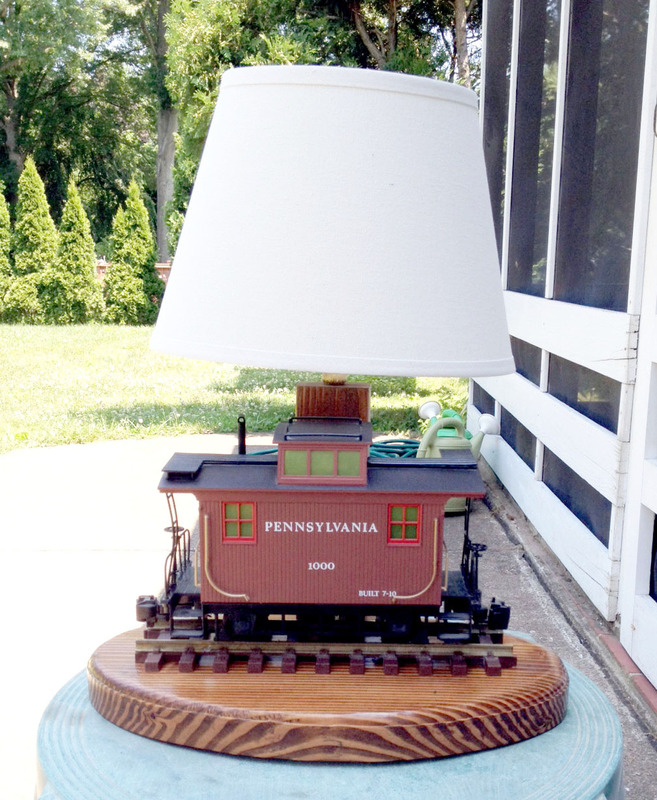 You can use anything – it doesn’t even have to be a piece of wood. I’m so thrilled to have my hubby’s old clock off the mantel and replaced with this one! 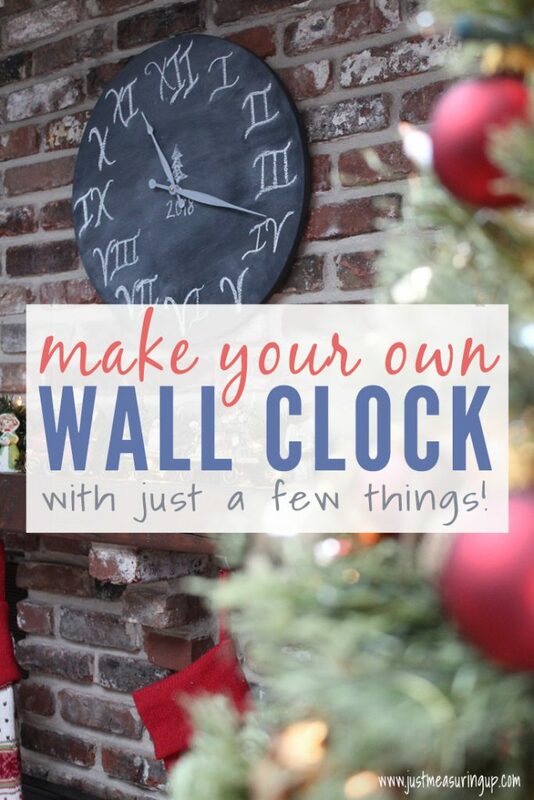 It brings a more modern element to the room – and it’s fun seeing my handwriting on a huge clock! 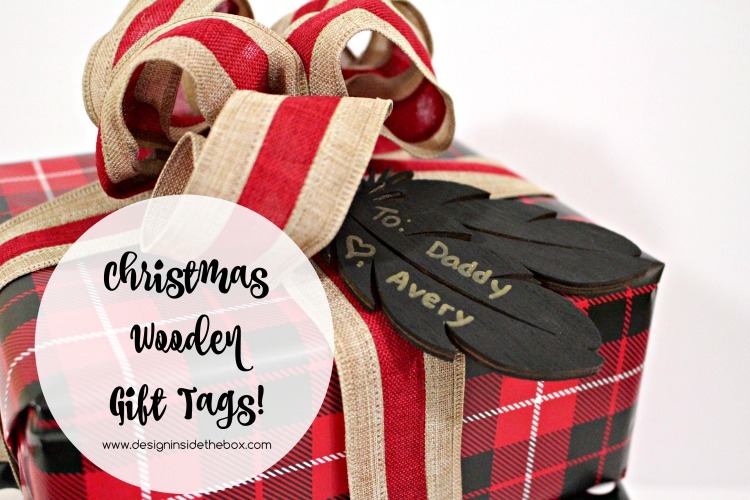 Check out what the other talented DIY bloggers made this week in this roundup of my favorite DIY gift projects for the holidays or see all of the Deck the Home DIY projects. One of the things I love about DIY projects is that you can literally make anything. If you can’t find the style you like, you make your own. If you can’t afford the real deal, you make your own. Outdoor yard decorations can be sooo expensive, but you don’t need to worry about that any longer. Just make your own! 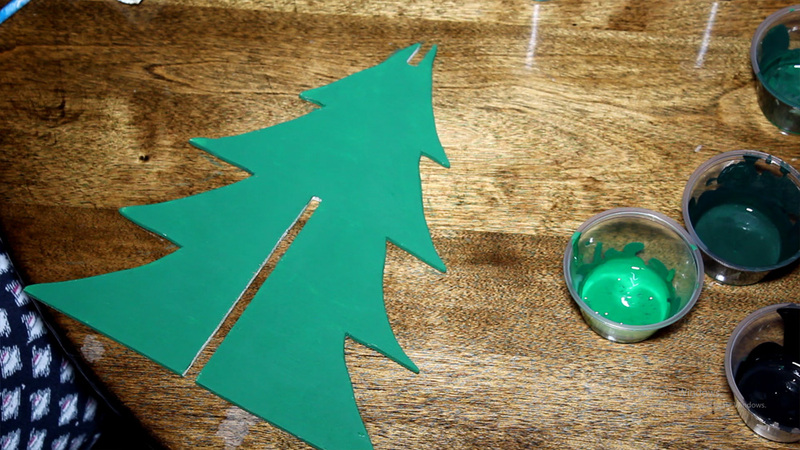 Rather than spending the money to adorn your front yard, you can use materials you already have to DIY your own outdoor Christmas decorations. 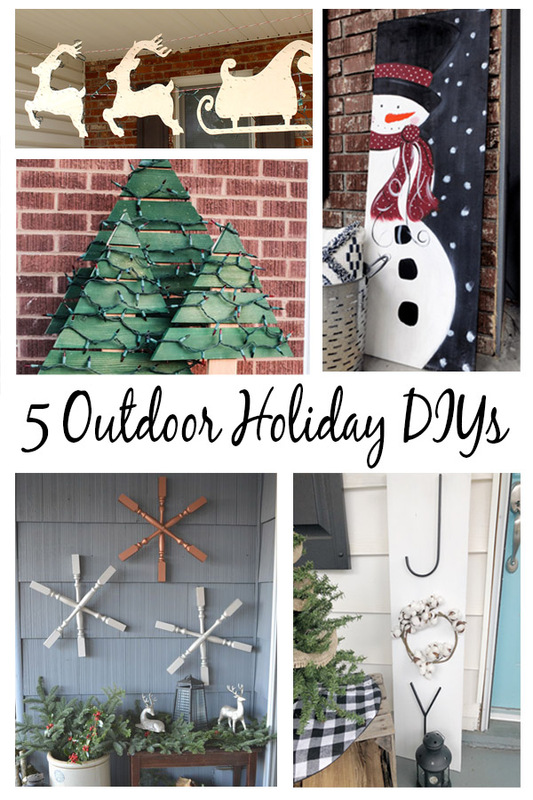 Today, I’m sharing 5 DIY wooden yard decorations that you can easily make to decorate your outdoors for the upcoming holidays. 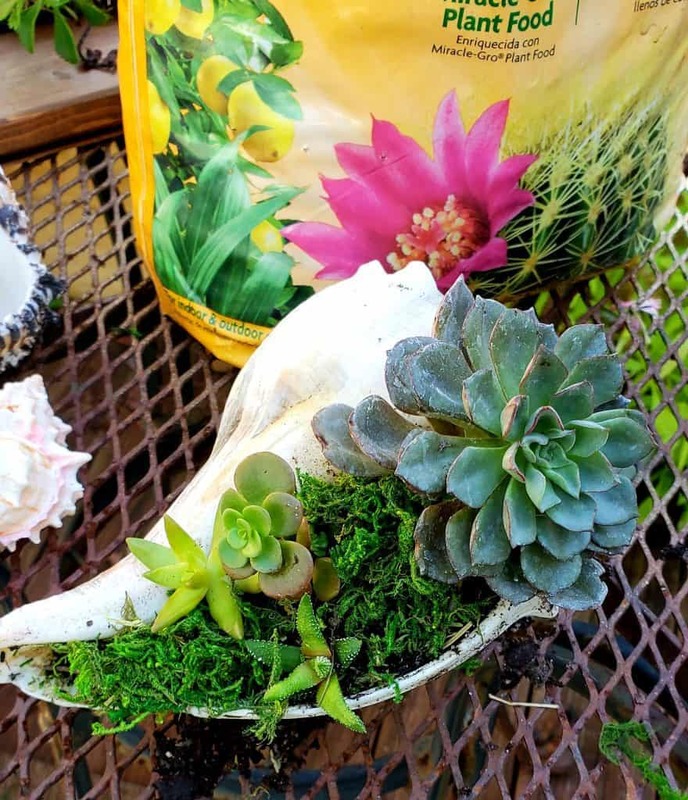 From repurposing old materials to using scrap wood out to 30 minute or less projects, these 5 outdoor DIYs have something for everyone. 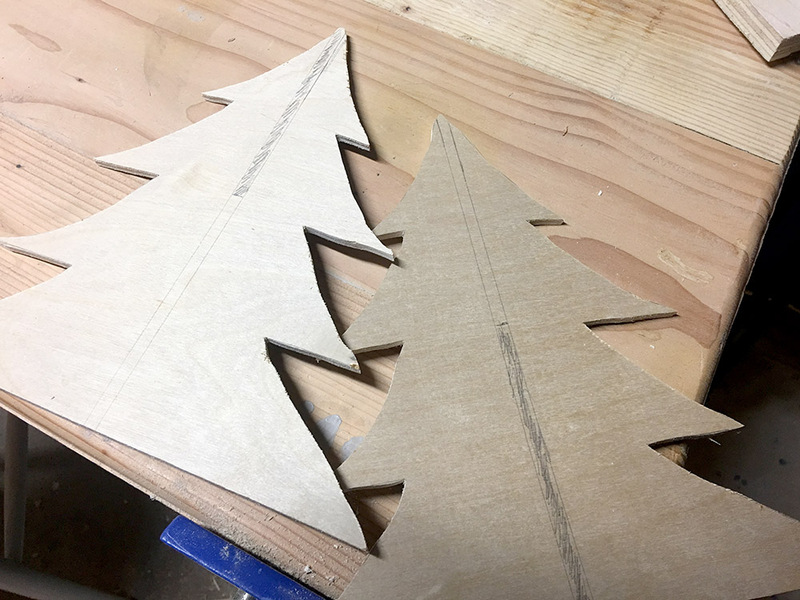 These outdoor wooden Christmas trees from Megan at Two Feet First are adorable! 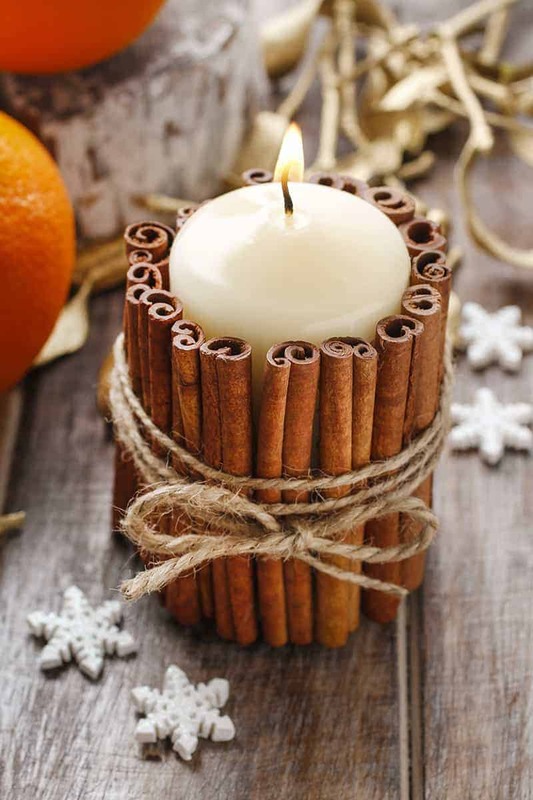 She made them with cedar fence pickets – and even has a creative way to light them up. I love how the lights make the trees look decorated, and they fit perfectly into a porch planter box. Her tutorial is super easy-to-follow and will have you making them in no time. 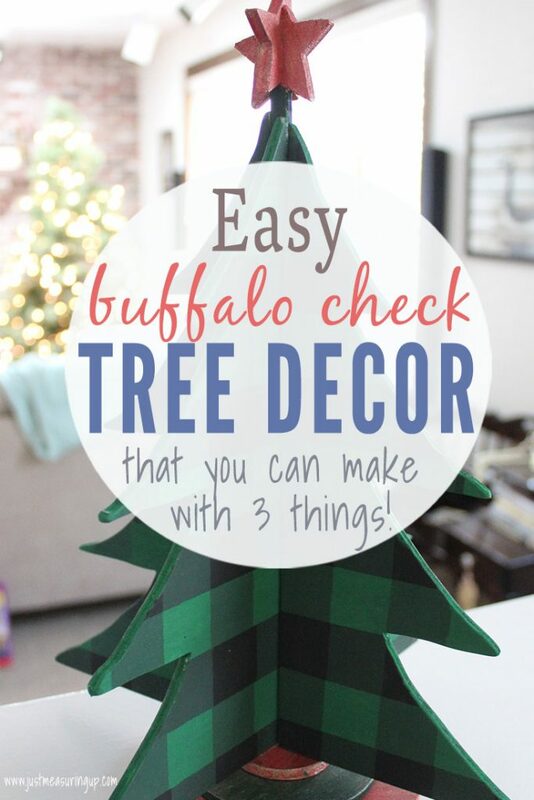 If you’ve been wanting to make a cool holiday yard decoration, this is definitely a fun one to make. This reindeer and Santa sleigh turned out so cute! The whole thing is made from plywood and a couple strings of lights. 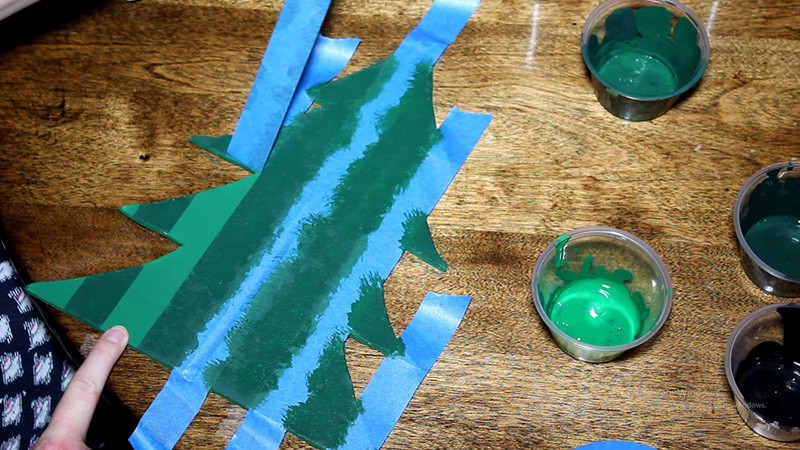 The full tutorial will show you exactly how to make your own Santa sleigh decoration – it even shows how to suspend it in the air using your front porch. 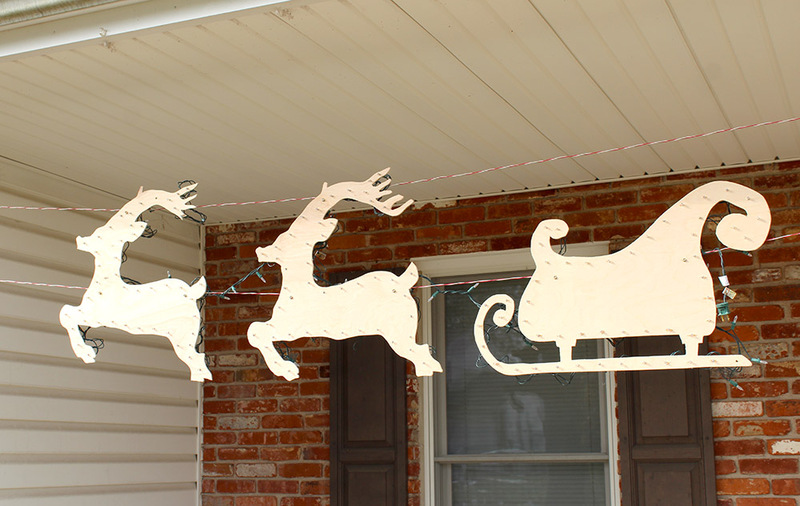 If you have been wanting reindeer and a sleigh for your yard but don’t want to spend the money, this is the perfect holiday yard decoration on a budget. It was made for less than $20. And, if you already have the plywood, then all you’ll need are the lights. 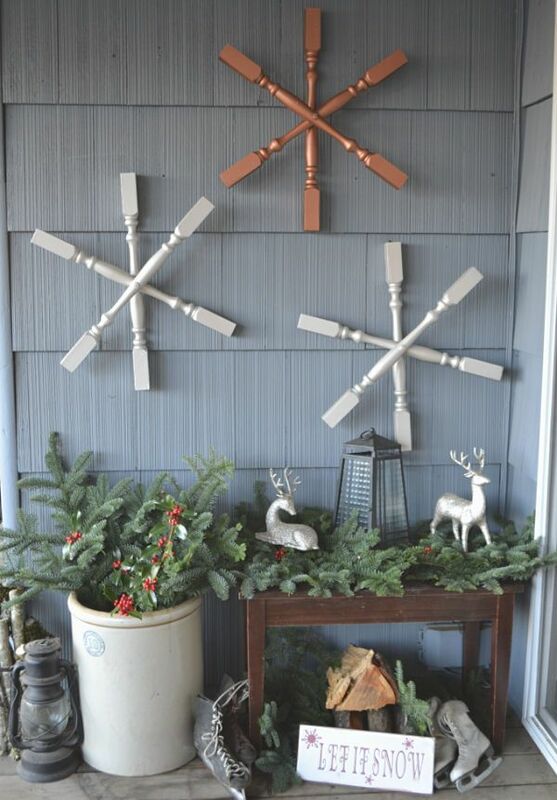 How cute are these DIY porch snowflakes from Amy at 1905 Farmhouse?! She made these from stair spindles, and they turned out amazing. 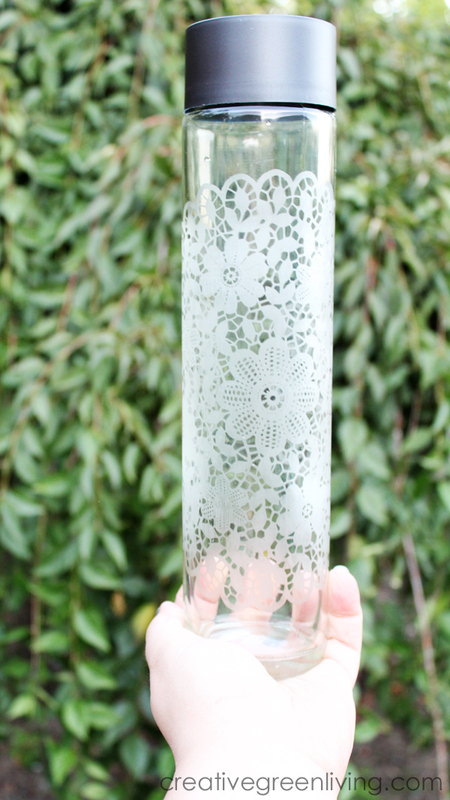 I love creative DIYs that are made from something other than their intended purpose. I love the colors Amy chose too! 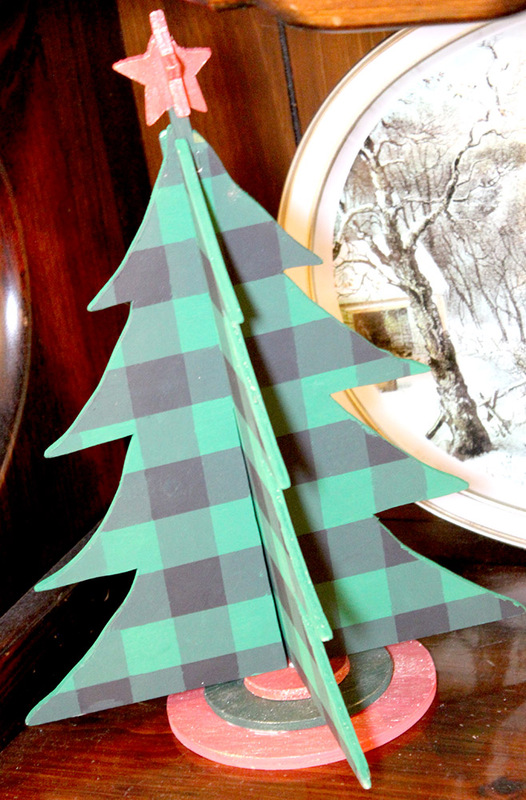 You can check out how to make these along with her holiday porch decor. This adorable wooden snowman is from Thea at That Sweet Tea Life. 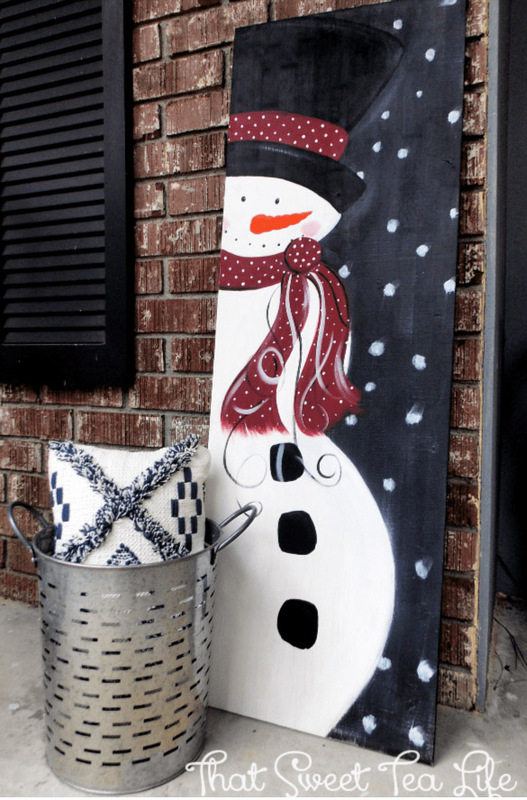 She turned a wooden board into this beautiful snowman. She gives the best painting tips, so I’m sure that you’ll be recreating this in no time. 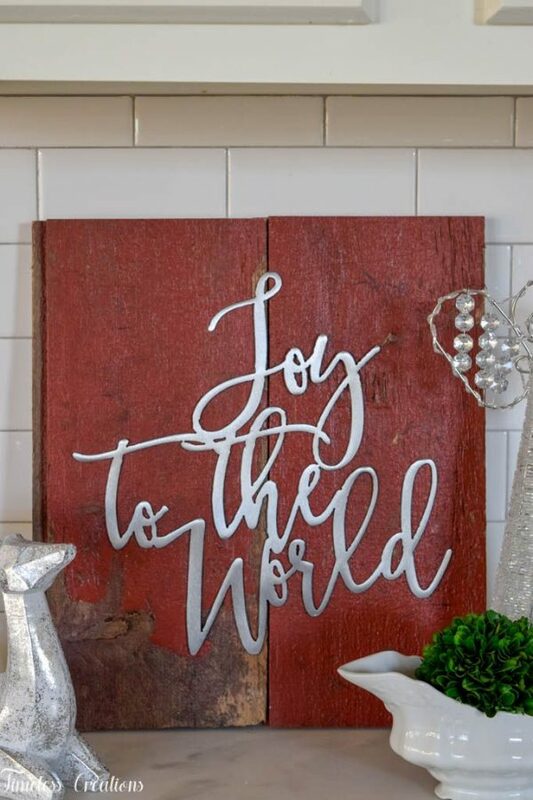 I am loving this holiday Joy sign from Patti at Renovating Mapleson Manor. She made it with two metal letters and bent a cottonwood stem to make the O. Sooo creative! I love her simple, elegant style. 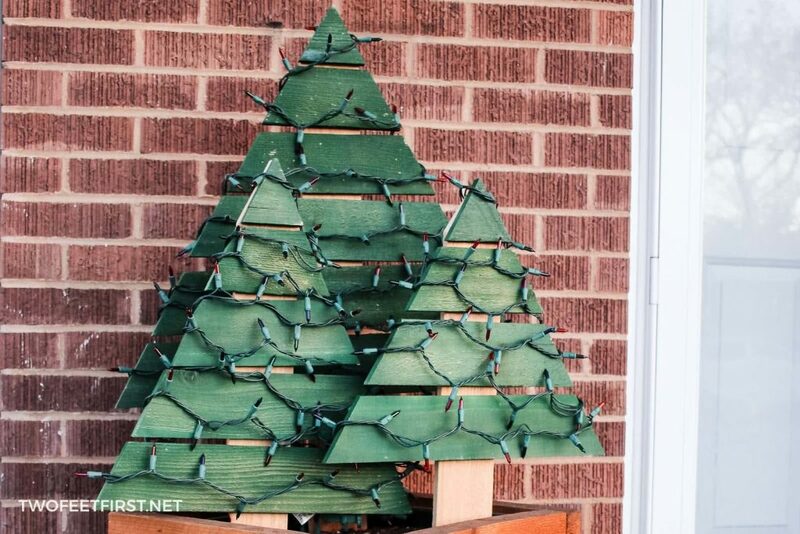 So there you have it, 5 outdoor decorations that you can make this holiday season. 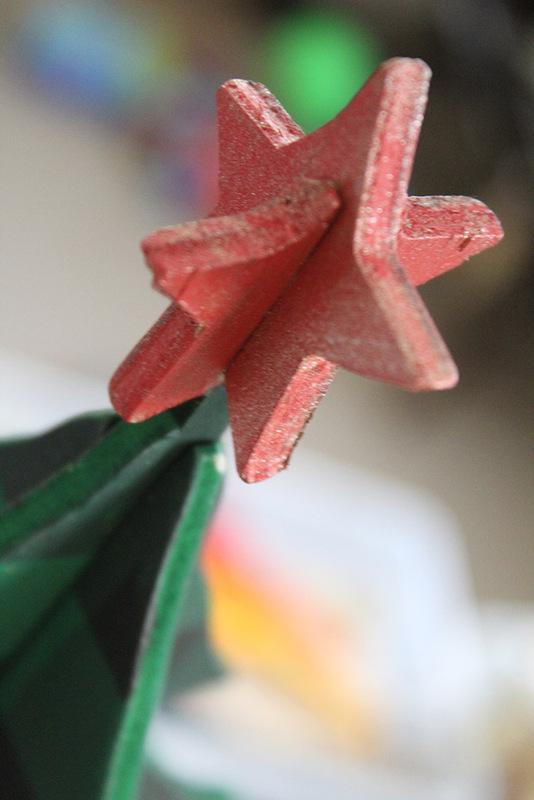 They are perfect for decorating on a tight budget, can reuse old or scrap materials, and can be made quickly. When you are planning your outdoor holiday decor, be sure to keep this awesome Christmas DIYs in mind. Be sure to check back on Monday morning for the next week of the Deck the Home blog hop. 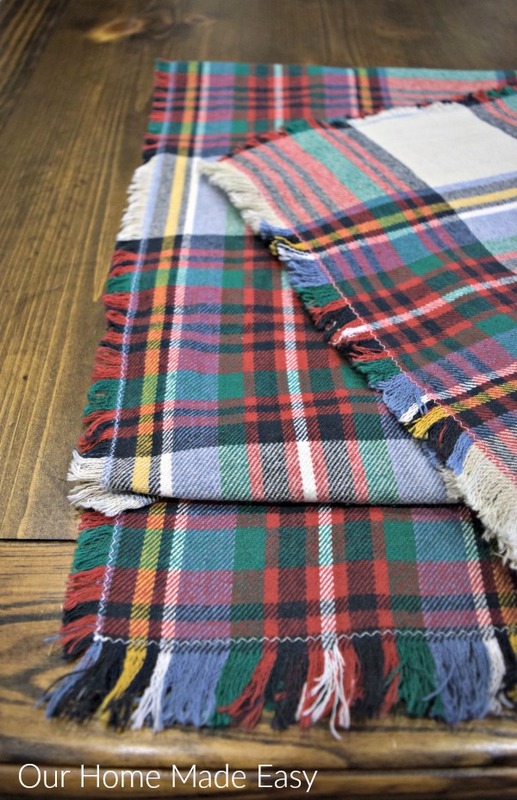 The theme is gifts – anything you can make someone else for the home. I got a sneak peek of a few of the projects, and they do not disappoint! We all know that I love Christmas. Hence, all the Christmas DIY projects. If you are just joining us, the Deck the Home Blog Hop is a 5-week series of amazing DIY holiday projects brought to you by 26 very talented DIY and home bloggers. Each week, all 26 of us share a project centered on the same theme. The first week was holiday door decor, the second week was wooden projects, and here we are at the third week. 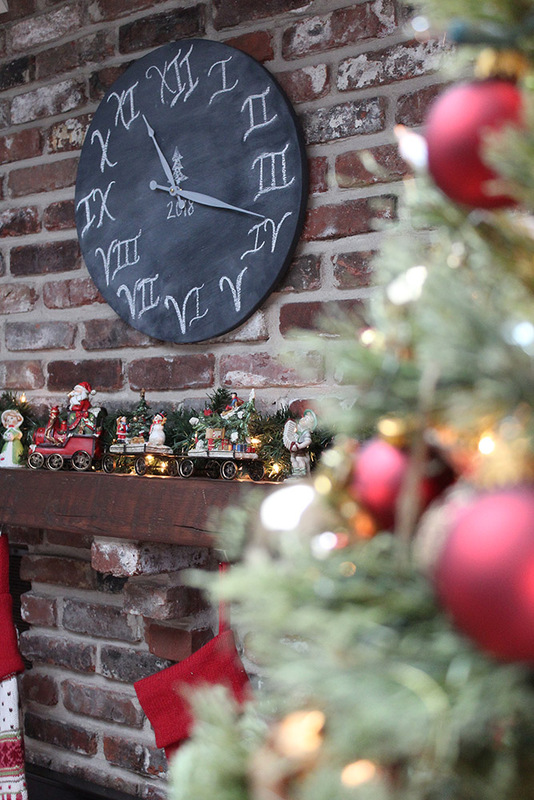 This week’s Deck the Home theme was none other than outdoor holiday decorations. I just had to share my favorite this week – which were these outdoor wooden trees made from fence pickets. 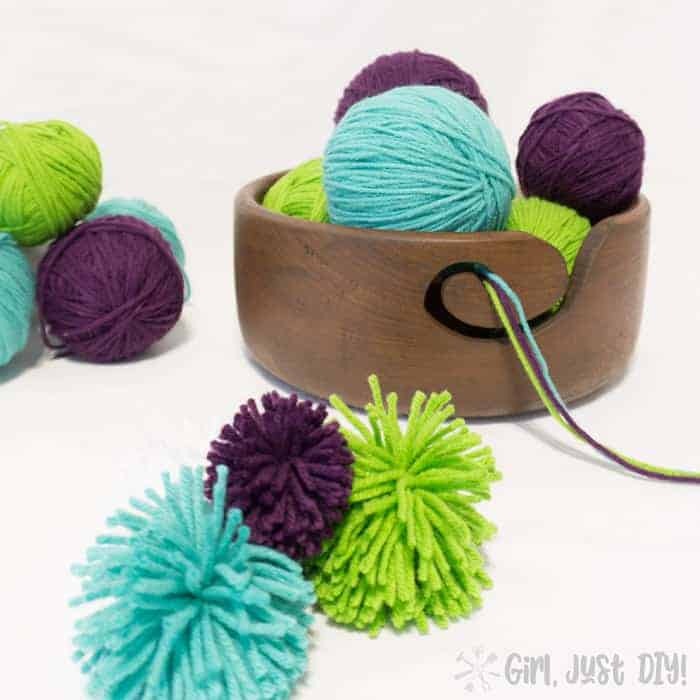 My friend Megan over at Two Feet First shared this tutorial – and it’s awesome! 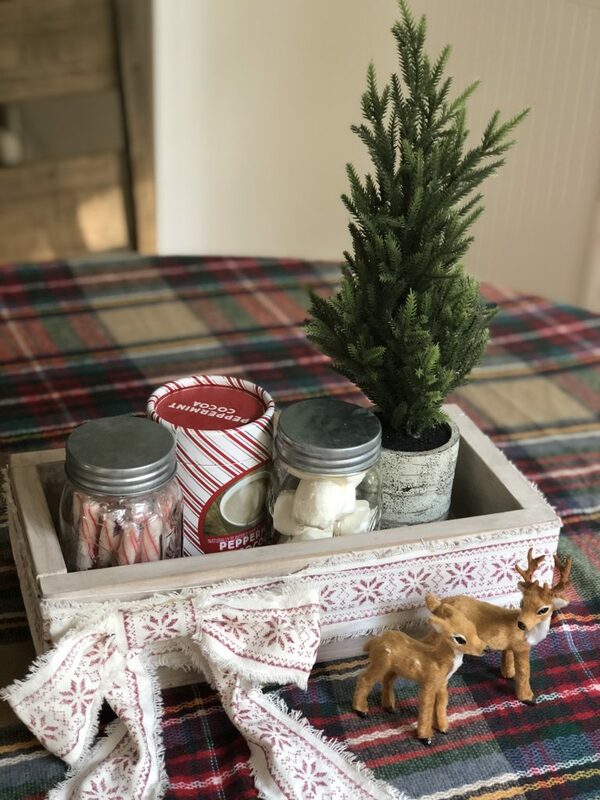 With a little wood, spray paint, and lights, she made these three easy wooden trees, which look amazing in the porch planter. 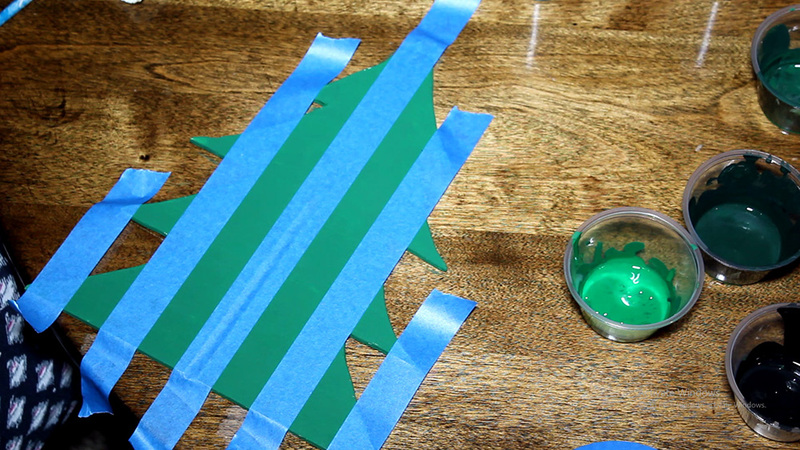 The DIY Christmas trees even light up – and you can easily take the lights on and off for easy storage. Megan is a DIY blogger who is in the process of updating her home – she has tons of awesome tutorials, especially for beginner DIYers. Definitely check her blog out, as it’s filled with little DIY gems. Don’t forget to stop back on Friday, as I will be featuring a few more outdoor projects from this week’s awesome Deck the Home Blog Hop. Thanks for joining us! If you’re wondering what my hubby and I made this week, check out our Outdoor Santa and Reindeer Sleigh. It’s a cool little plywood project that cost less than $20. Plus, it looks pretty cool suspended in the air. Aren’t outdoor decorations so fun?! Looking to get into the holiday spirit? I’ve got just the jump start you need! 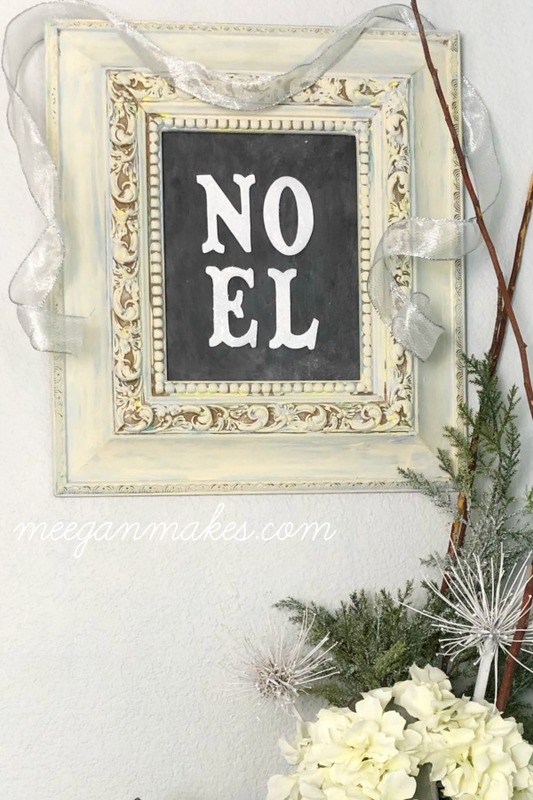 You see, we are in the midst of our Deck the Home blog hop, where dozens of incredible DIY bloggers are sharing themed holiday DIY projects each week. 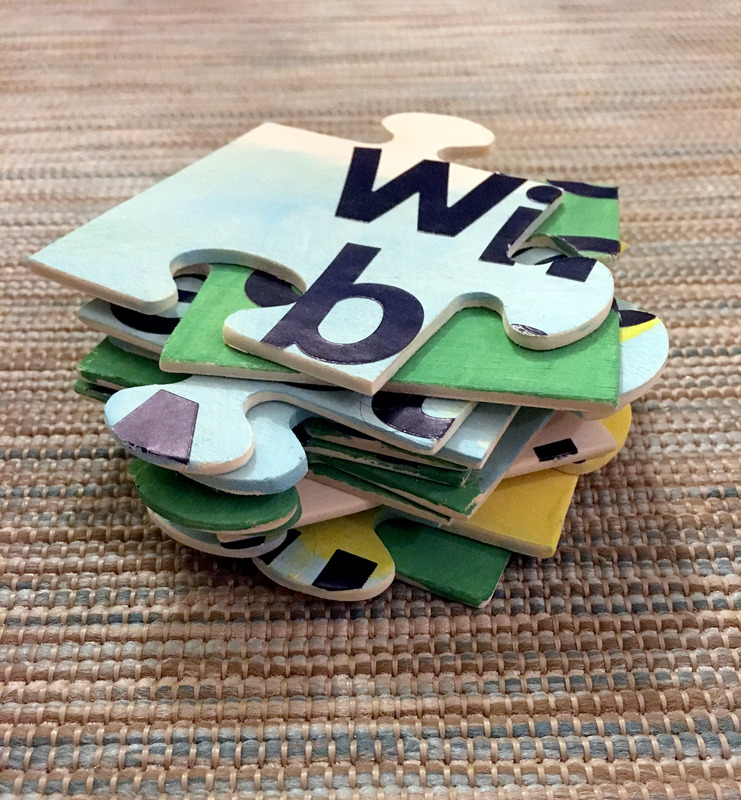 This week’s theme was wood projects – and I’m so excited to share these amazing wooden DIYs with you. 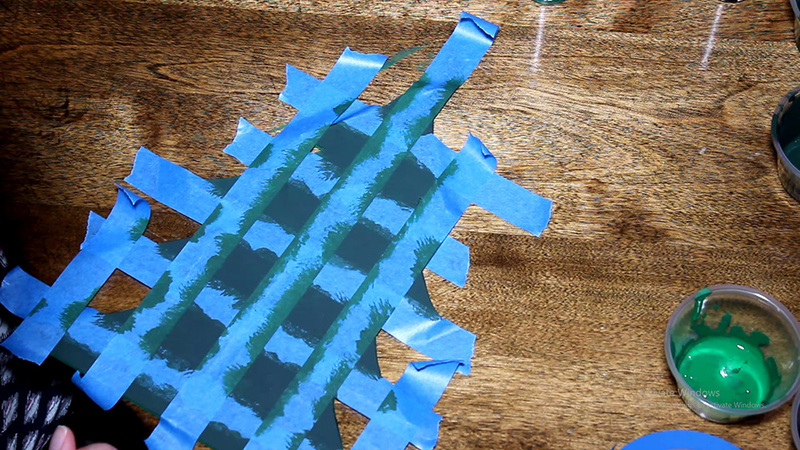 While you’re at the craft store, pick up a few bottles of acrylic paint so you can paint your own buffalo check pattern – with just tape and paint! 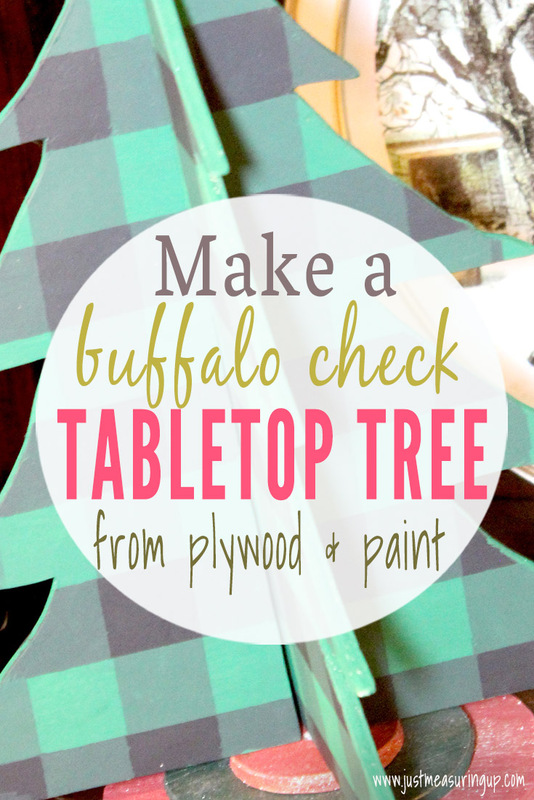 We made these wooden tree cut-out and then painted it in buffalo check. 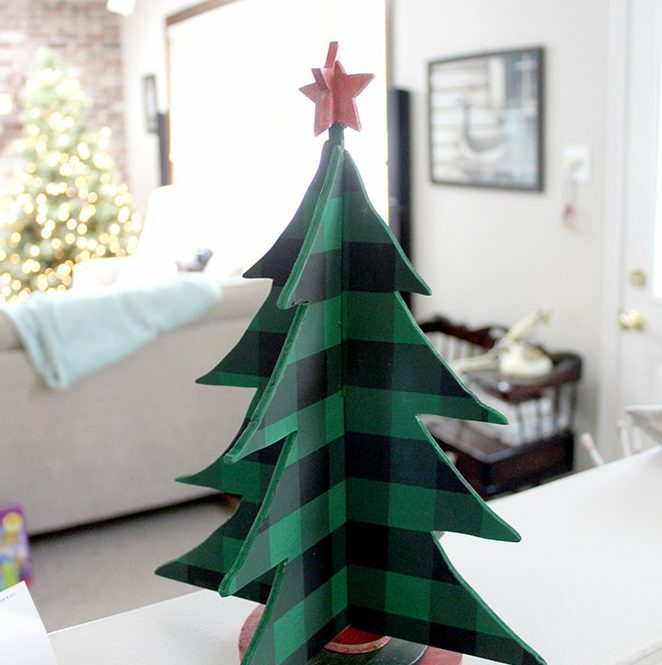 I’m loving this tree round garland from Jessica at Jessica Lehman Interior Design. 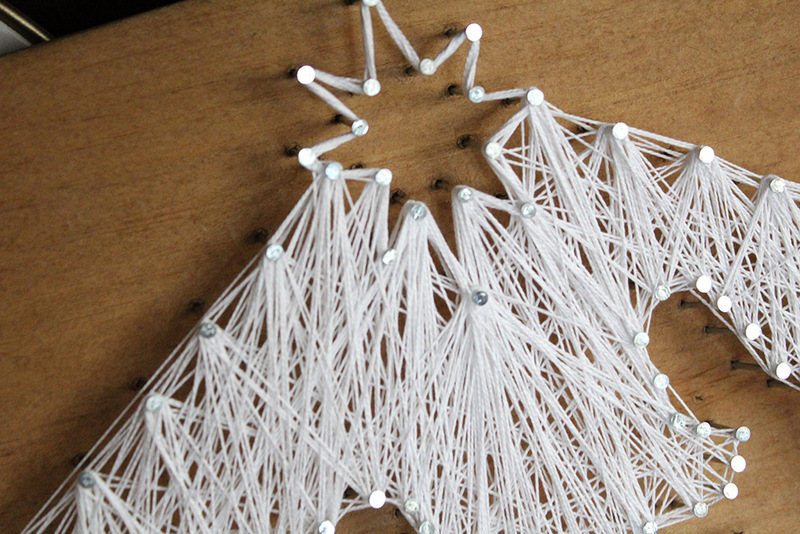 With the little round circles, she made this beautifully simple Christmas decoration. 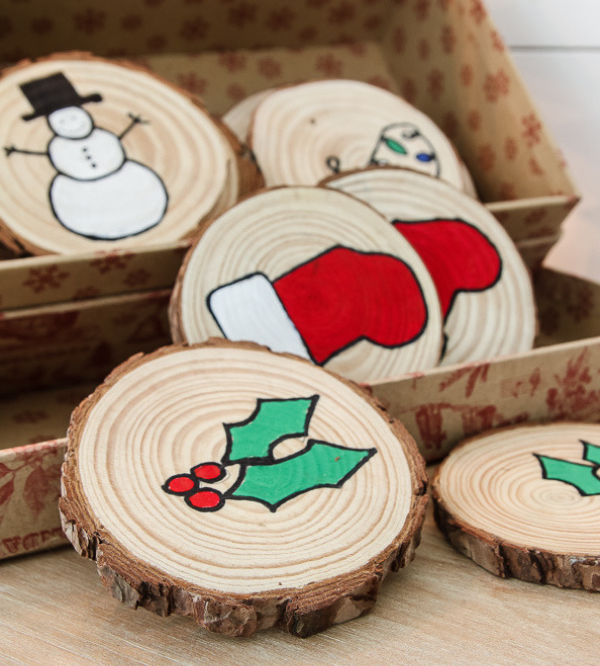 I definitely have to pick up some of these tree rounds during my next trip to the craft store. 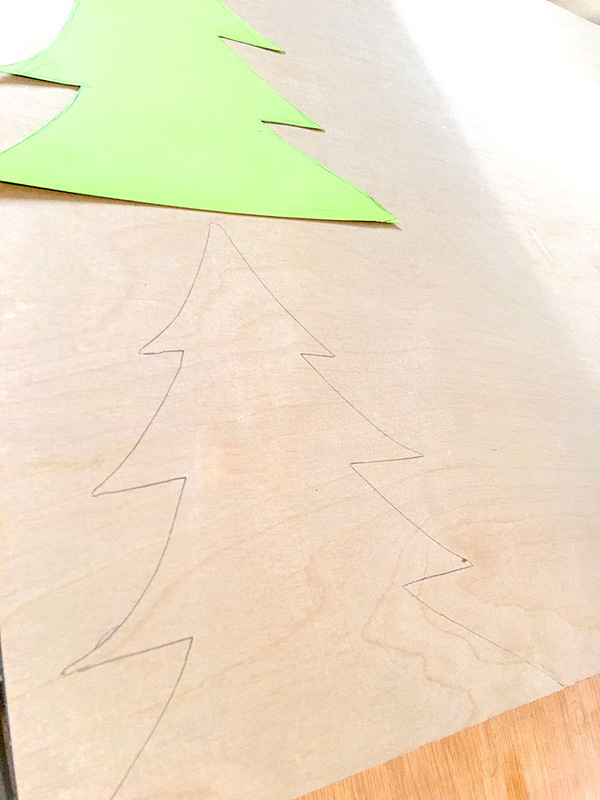 This paint stick Christmas tree sign is soooo creative! 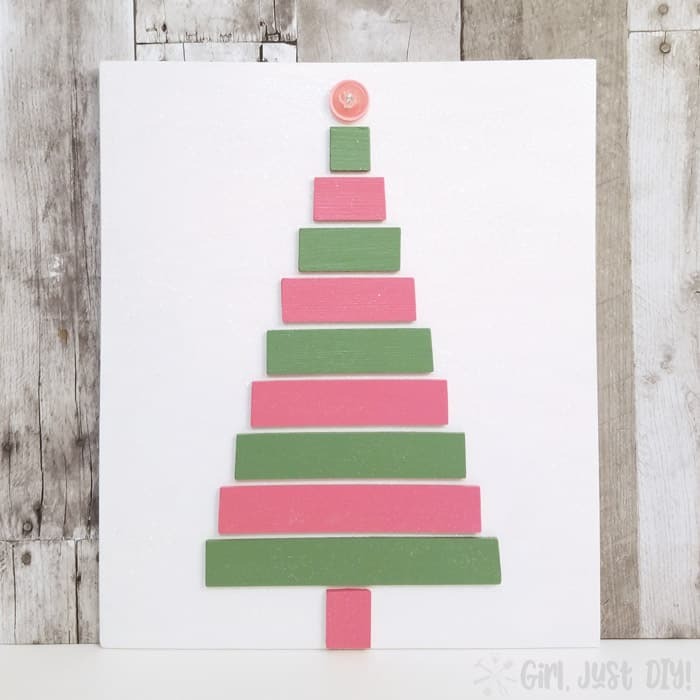 Toni from Girl, Just DIY made this Christmas tree wall hanging using paint sticks! She includes all the details of how she got these into the Christmas shape over on her blog. My favorite part is the colors – they are Christmasy but not the typical shades. Doesn’t this project just make your jaw drop?! I still can’t believe it’s homemade. 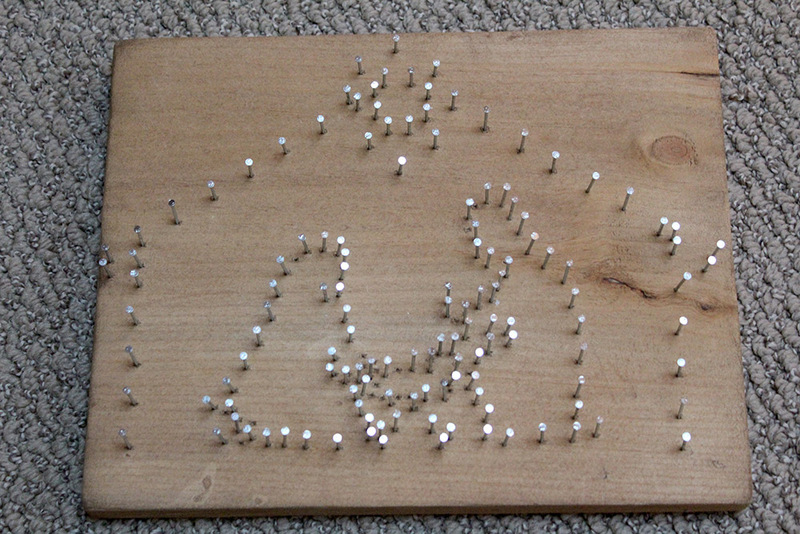 Samantha over at Little Bits of Home DIYed this sweet little nativity scene using hand-painted peg people. I didn’t know peg people existed – so that’s definitely on my craft store list. 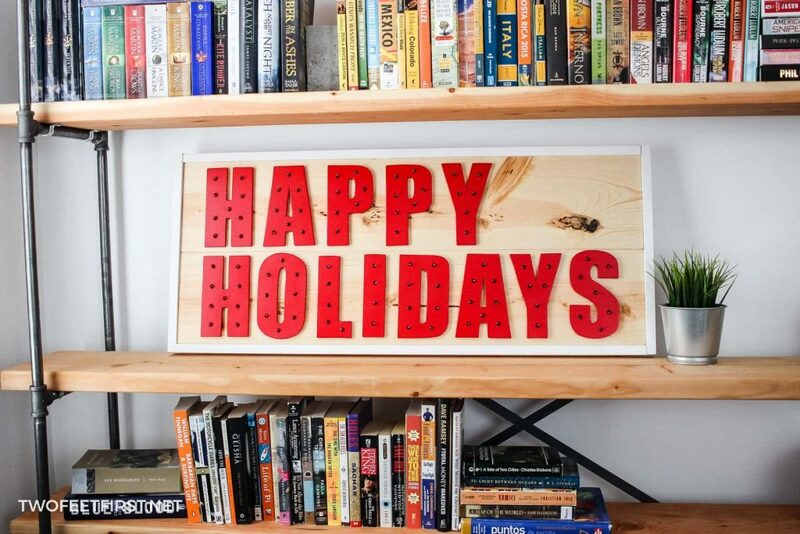 Another project you’ll love is this Happy Holidays wood sign from Megan at Two Feet First. 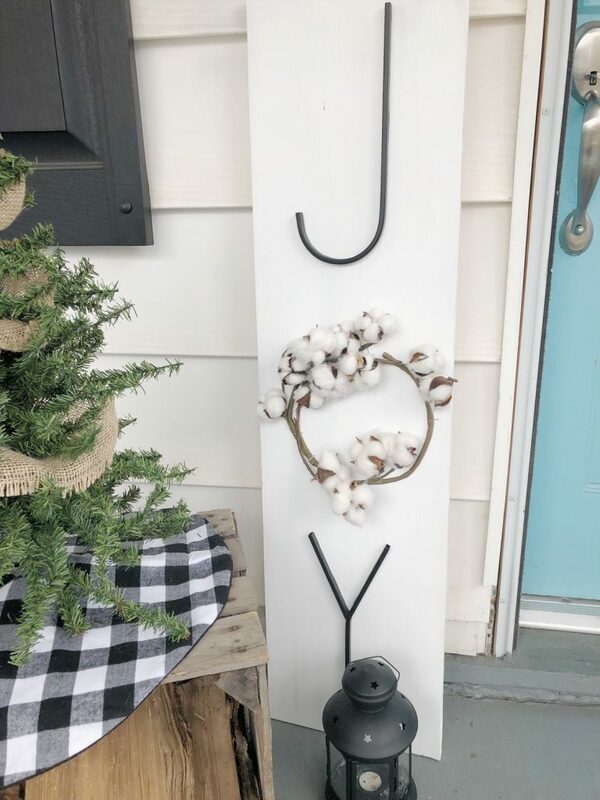 She made the letters out of wood, but you could pick those up at the craft store along with a string of lights to make this spectacular sign. 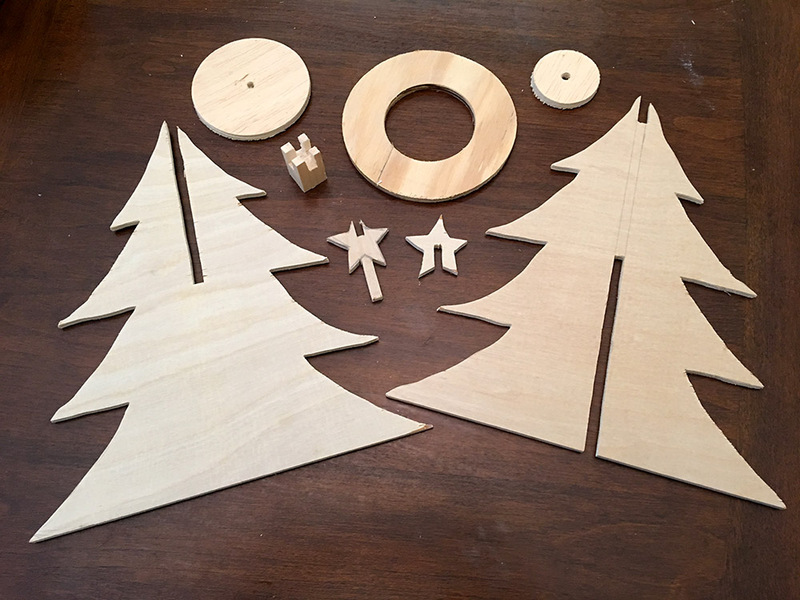 Last but not least is this amazing holiday matching game made from wood circles. 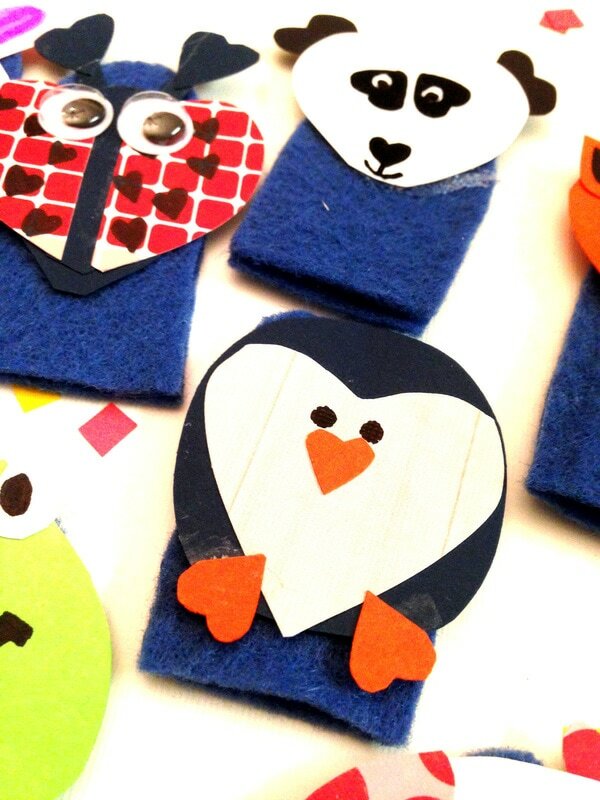 Carmen from Gross to Grandiose thought of these cute idea, and I can’t wait to make one for my kids too. 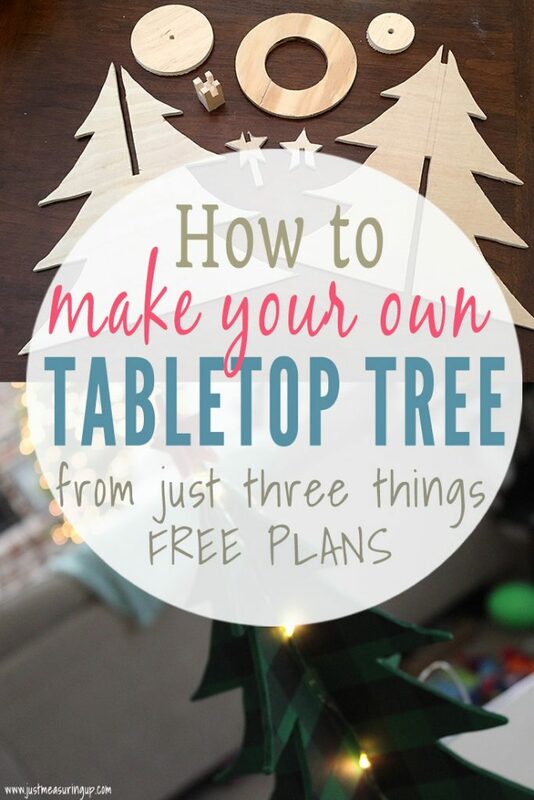 I hope these ideas inspired you to start making and creating this holiday season! 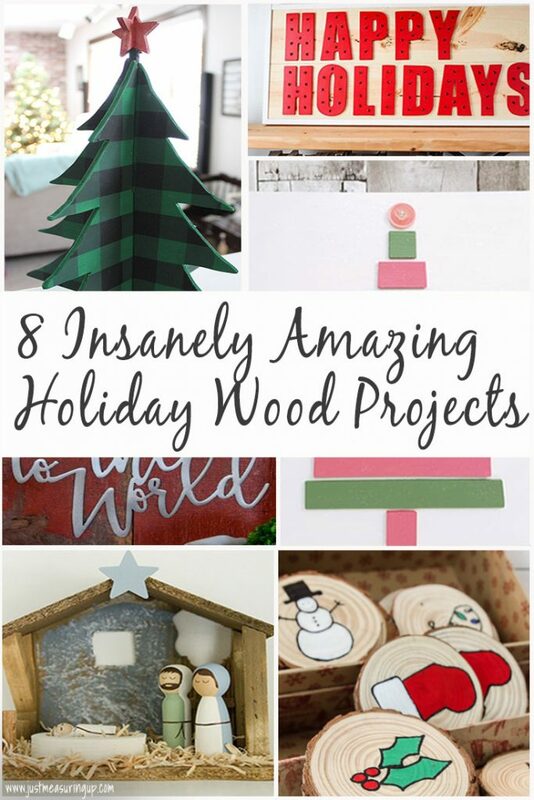 Check back on Sunday for more awesome DIY posts from this talented group of bloggers. Next week’s theme is outdoor decor. I am just a little bit obsessed with nativities. I mean, they are the best reminder of what Christmas is all about. So, when I saw that my friend Samantha over at Little Bits of Home made her own DIY nativity – I just had to share it! You see, we are in the midst of our Deck the Home Blog Hop. 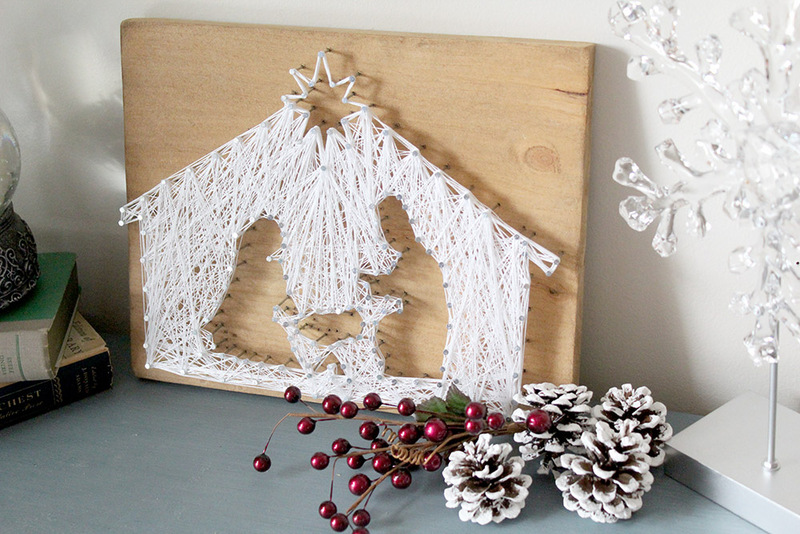 It’s a 5-week series of amazing DIY projects, brought to you by a group of talented bloggers. 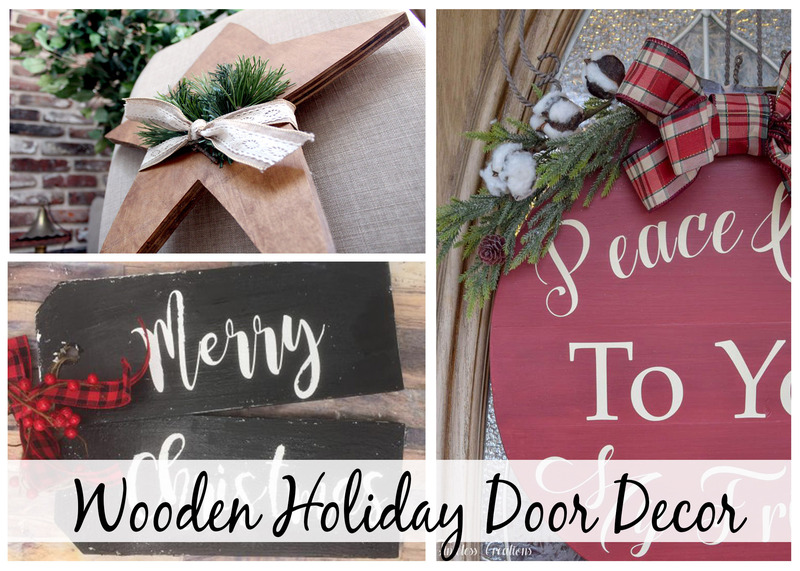 Each week has a theme – the first was door decor, and this week is wood projects. There were so many awesome wood projects, but this sweet nativity scene left in me awe. Samantha found peg people at the craft store and hand-painted them, turning the wooden figures it into this blessed little scene. From the wood chip hay to the creative manger to perfectly painted people, this nativity will just blow you away. Isn’t it absolutely incredible?! A little bit more about Samantha, she shares her DIY adventures on her blog Little Bits of Home. From room makeovers to organization to crafts, she has some incredible projects. 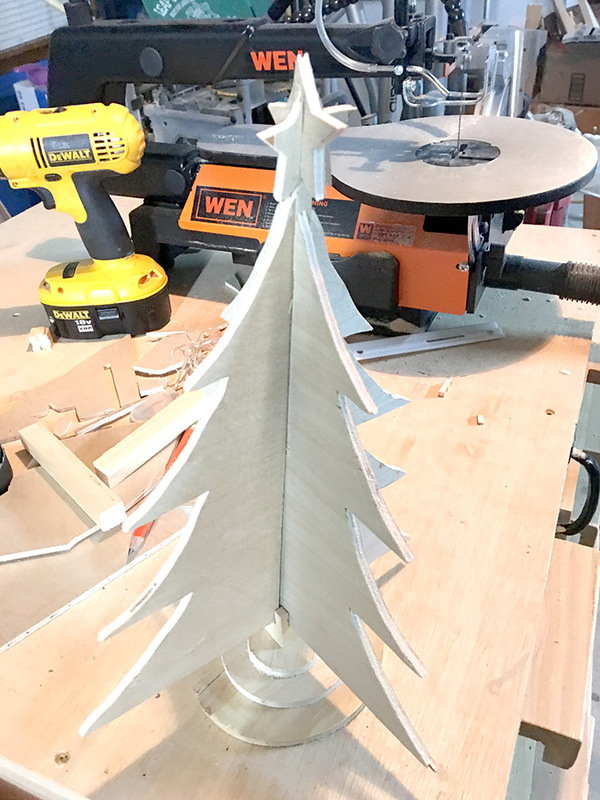 From wood mantels to holiday signs to homemade tree stands, this group of bloggers had amazing DIYs this week. 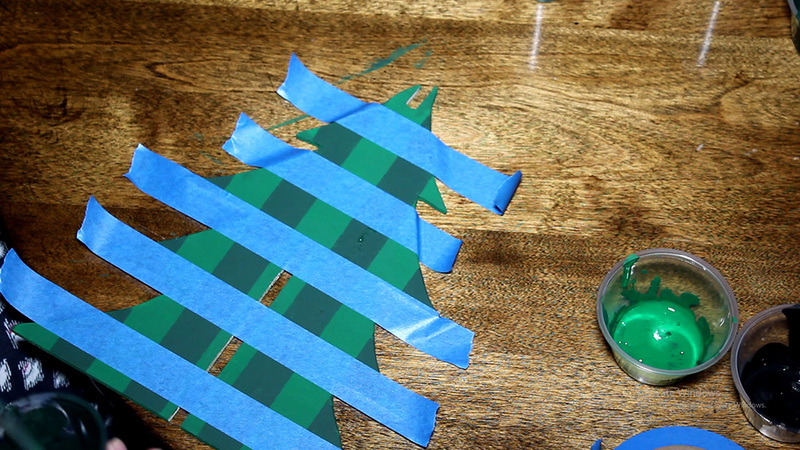 Be sure to check back on Friday for a round-up of my favorite DIY wood projects for the holidays. And, as an added bonus, next week’s theme is outdoor holiday decor. 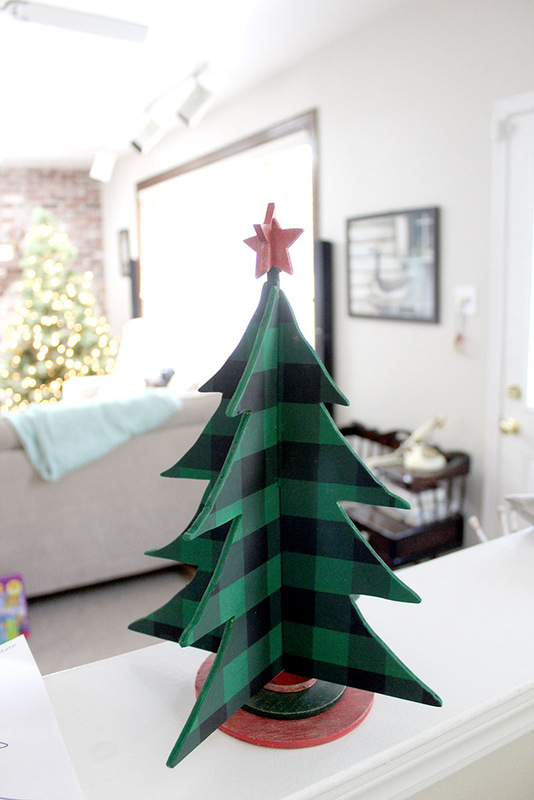 I’m really loving sharing all these awesome holiday projects with you in November! It makes me feel super organized for the coming season. I hope it’s helping you too! Well, my friends, the holiday season is upon us. And if you are anything like me, you’re probably loving every second of wandering the holiday aisles at Target and Home Goods. Seriously, sometimes I want to buy their entire Christmas section. 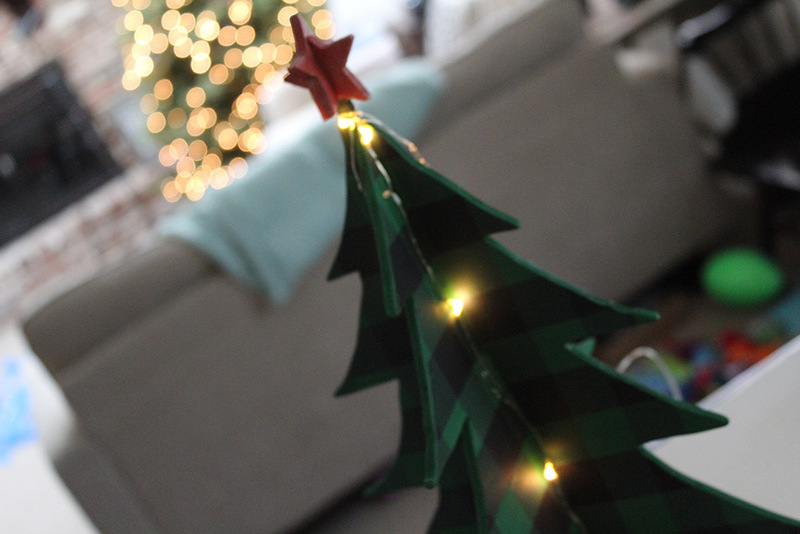 But you know what’s even better than spending a ton of money on gorgeous Christmas decor? Making it yourself for a fraction of the cost! Today, I’m sharing over 20 insanely creative DIY Christmas “wreaths” that are so simple to make. A few of these Christmas wreaths cost nothing to make, a few of them only took 20 minutes to make, and even more of them are so creative that you wouldn’t see anything like it in the stores. 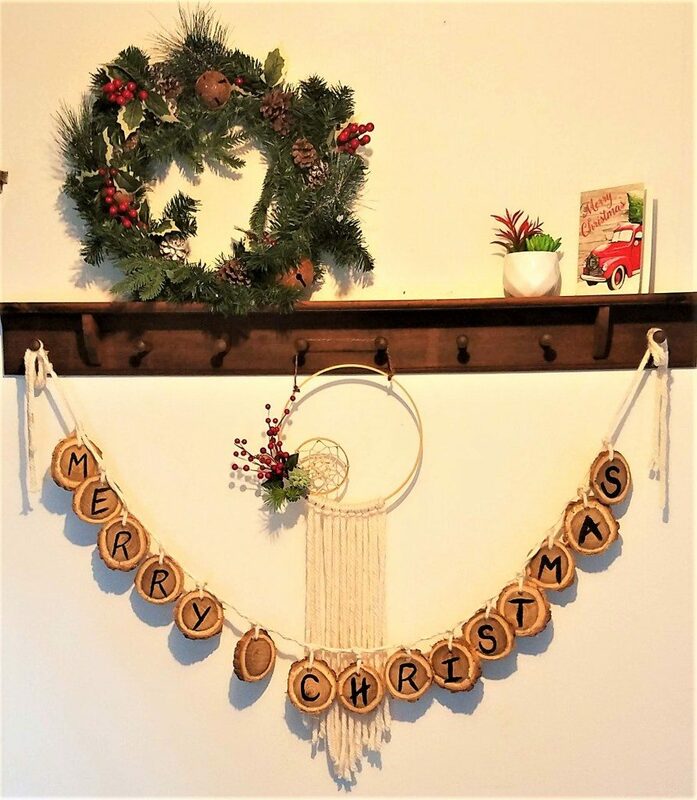 These creative wreaths fall into 5 categories – wreaths made from hoops, wreaths made from cool stuff, wreaths that are totally nontraditional, wreaths made from fresh greenery, wreaths made from wood, and wreaths that are beautifully classic. First up, we have wreaths that are all made from hoops. 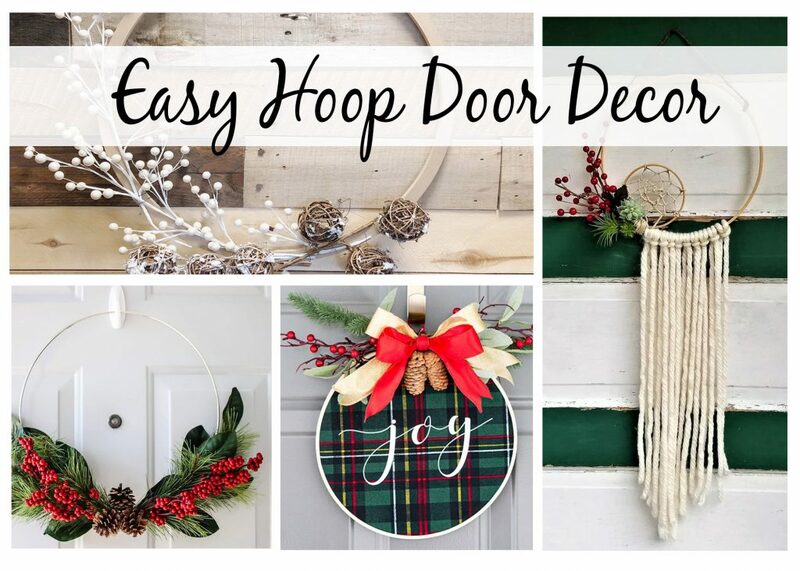 From rustic simplicity to boho chic, these wreaths all the basis of a simple hoop design. 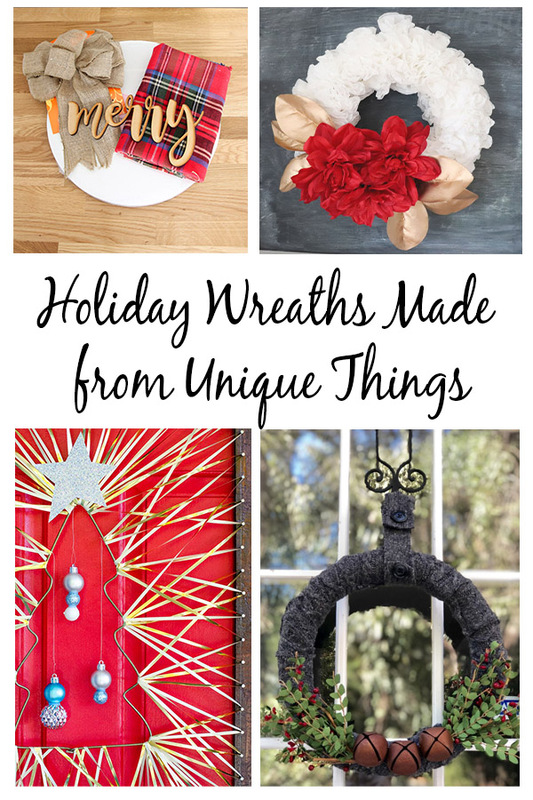 Next up is my favorite category – holiday wreaths made from unique things! 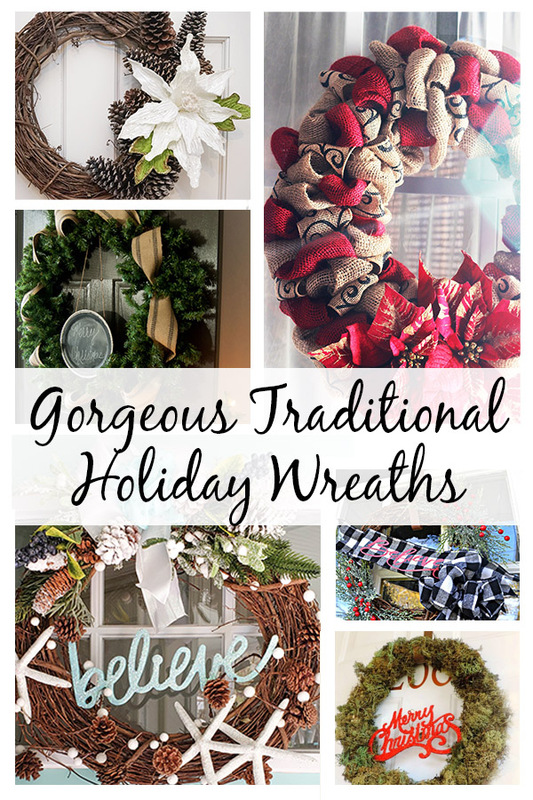 I love the creativity in all of these wreaths – from using old sweaters to coffee filters, these holiday wreaths are truly one-of-a-kind beautiful. Did you know that you can make some really creative and fun wreaths from wood? From the star we made to the pretty signs above (one is made from fence posts! ), you don’t want to miss these. Ahh another one of my favorite categories. You guys, these wreaths are amazing! 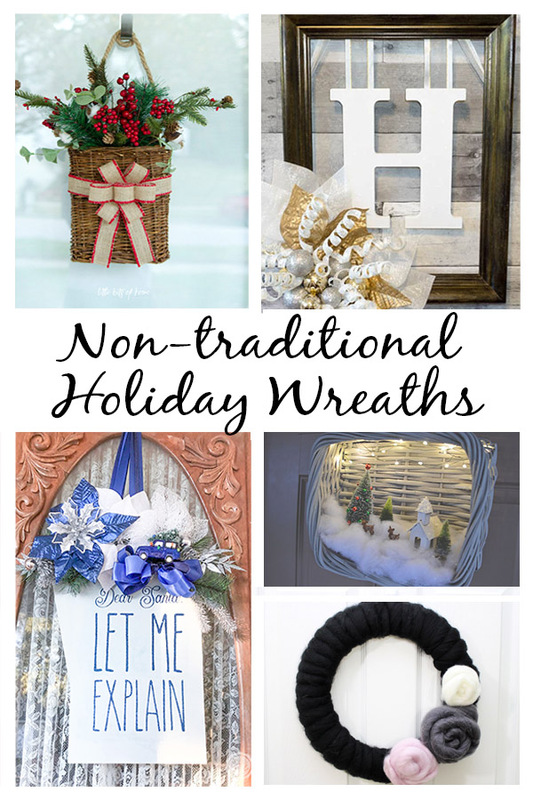 They are not traditional Christmas wreaths which is what makes them so darn creative! 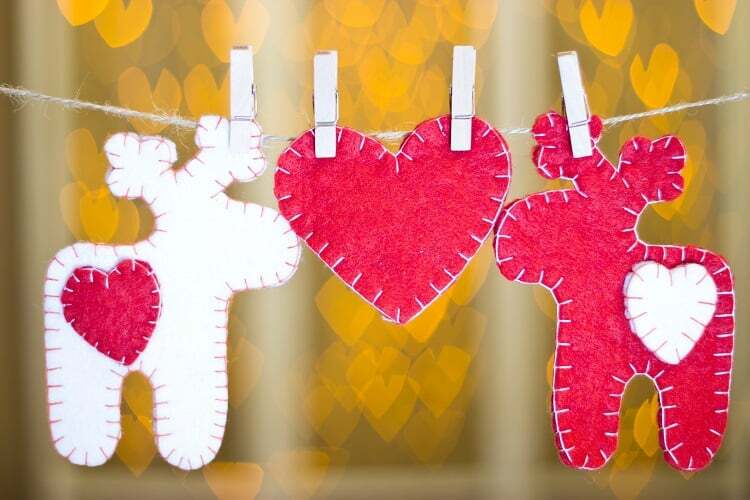 From a snow scene to gift tags to cuddly yarn wreaths, you will love these! It wouldn’t be Christmas without fresh greenery! 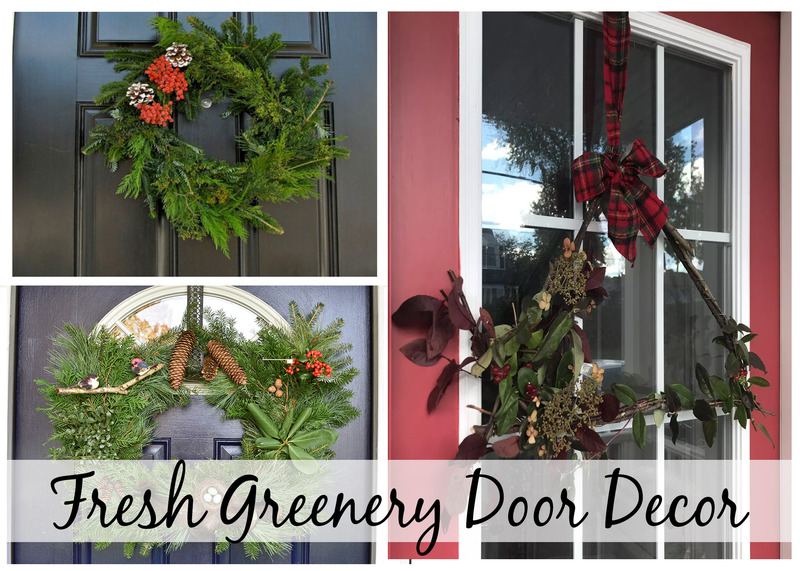 Here are three wreaths that feature fresh greens – some are even from the yard. They turned out so pretty, right?! Last, but not least, we have some beautiful classic wreaths. From burlap ribbon to beach-themed to floral Christmas garland, these wreaths are simple and gorgeous. 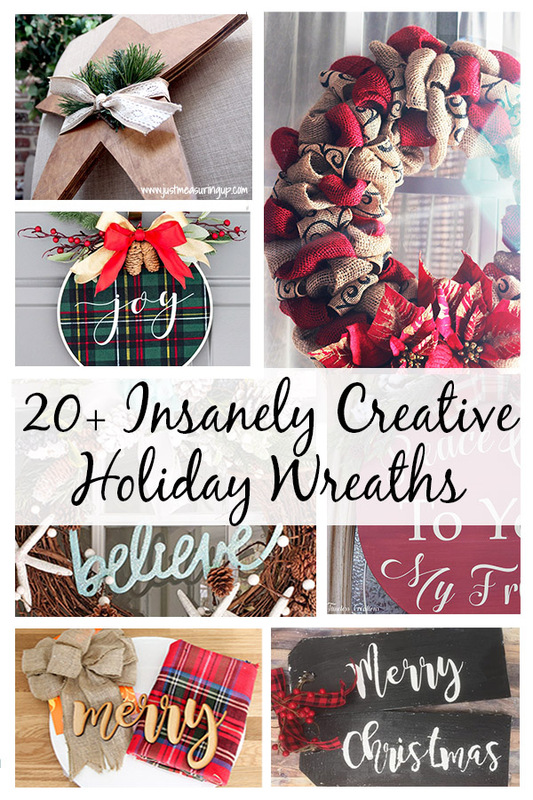 How inspiring are all of those DIY wreaths?! So many of them are simple to make and take a short amount of time. Definitely put some time aside this holiday season to make your unique door decor. It’s lots of fun, saves money, and you get to create something you’ll love!